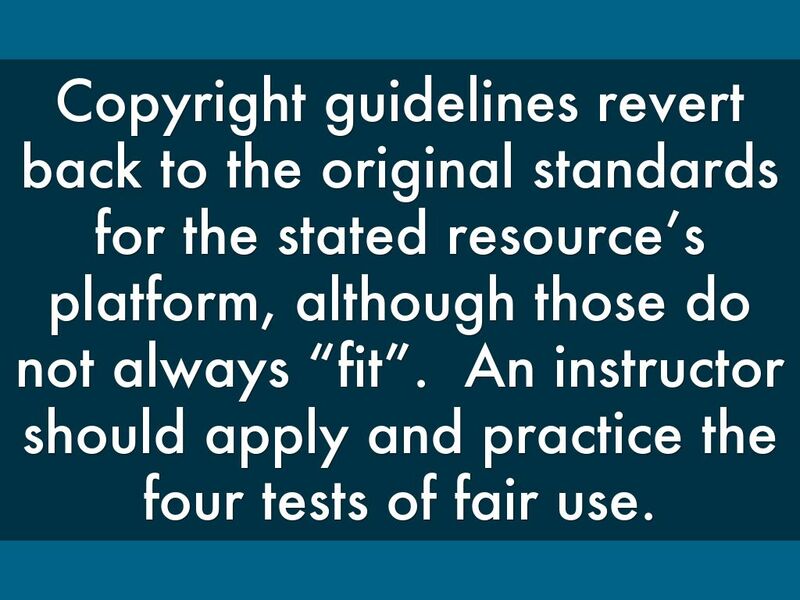 What every teacher needs to know about copyright and fair use. What is It? Why Does it Exist? In 1976, the United States passed the most current version of copyright law, which protects a work once it is “fixed in tangible form” (17 U.S.C.A § 101). 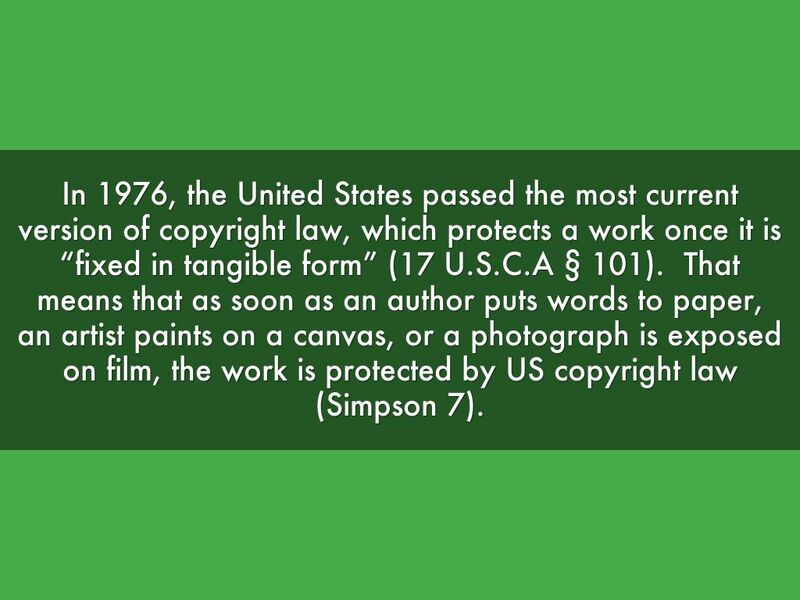 That means that as soon as an author puts words to paper, an artist paints on a canvas, or a photograph is exposed on film, the work is protected by US copyright law (Simpson 7). 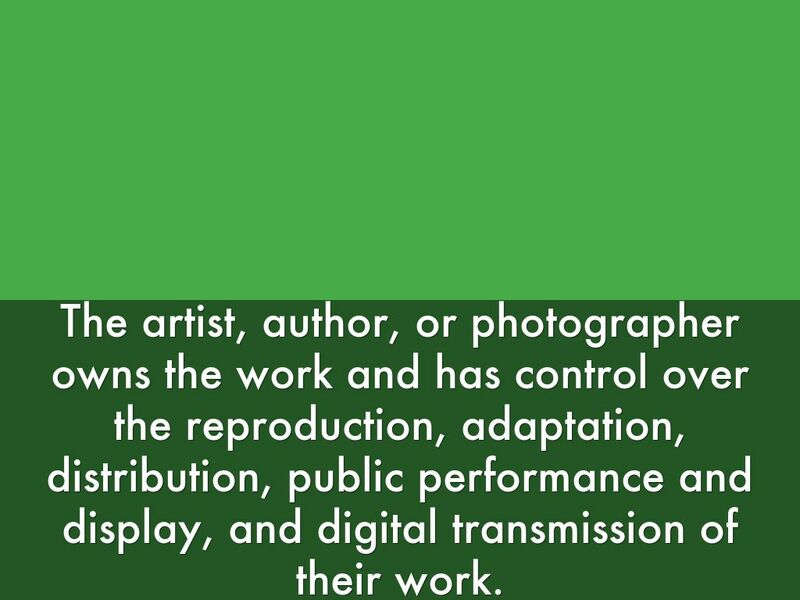 The artist, author, or photographer owns the work and has control over the reproduction, adaptation, distribution, public performance and display, and digital transmission of their work. As teachers, we support our families and ourselves by teaching students. 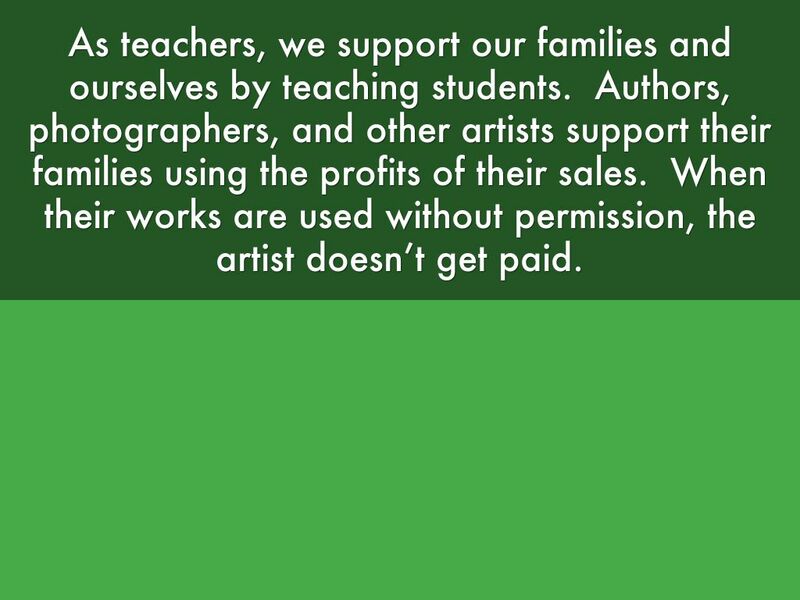 Authors, photographers, and other artists support their families using the profits of their sales. When their works are used without permission, the artist doesn’t get paid. 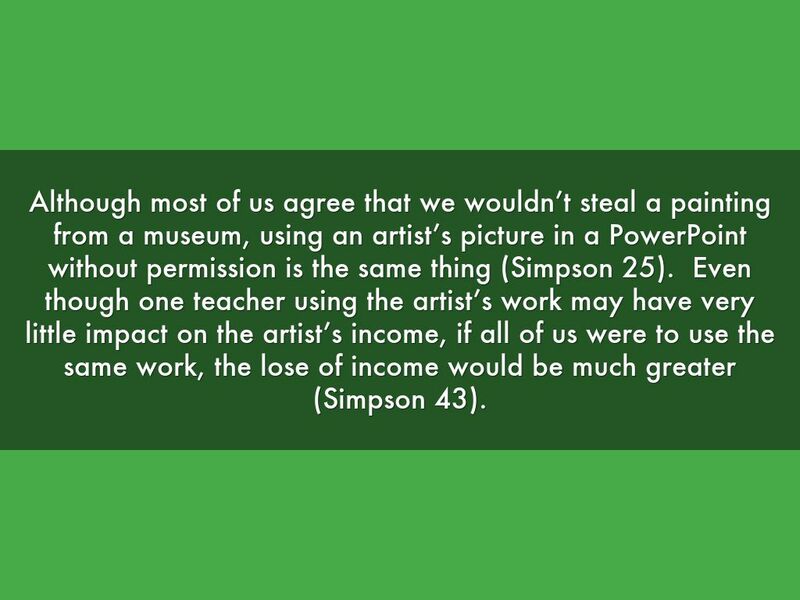 Although most of us agree that we wouldn’t steal a painting from a museum, using an artist’s picture in a PowerPoint without permission is the same thing (Simpson 25). Even though one teacher using the artist’s work may have very little impact on the artist’s income, if all of us were to use the same work, the lose of income would be much greater (Simpson 43). 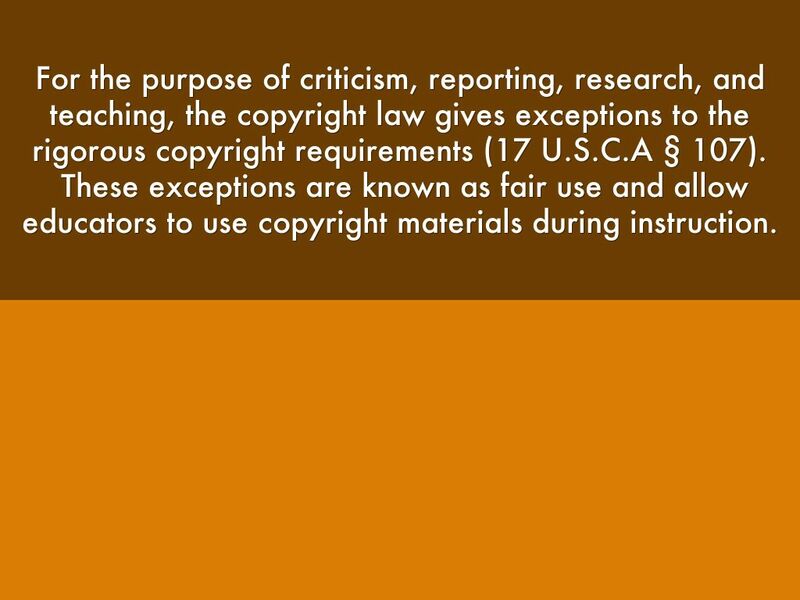 Luckily, the copyright law includes exceptions and guidelines for educators involving copyrighted materials. For the purpose of criticism, reporting, research, and teaching, the copyright law gives exceptions to the rigorous copyright requirements (17 U.S.C.A § 107). 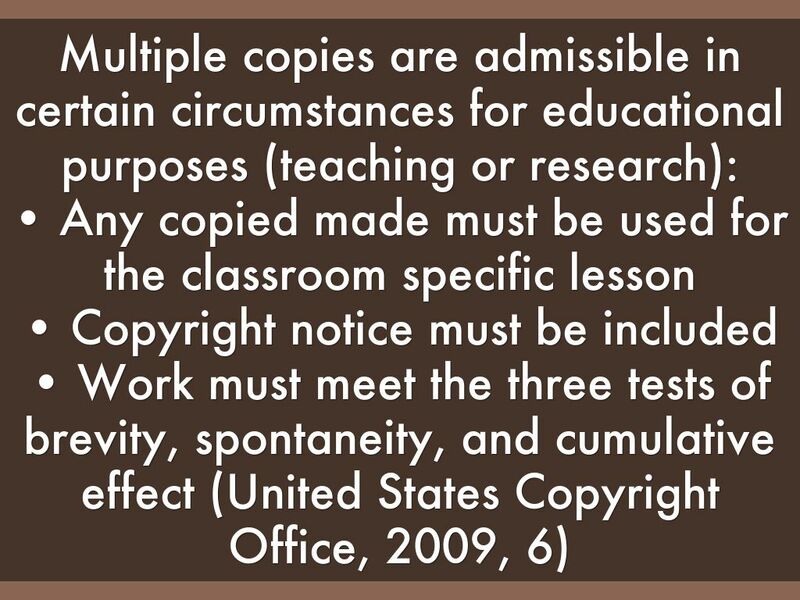 These exceptions are known as fair use and allow educators to use copyright materials during instruction. 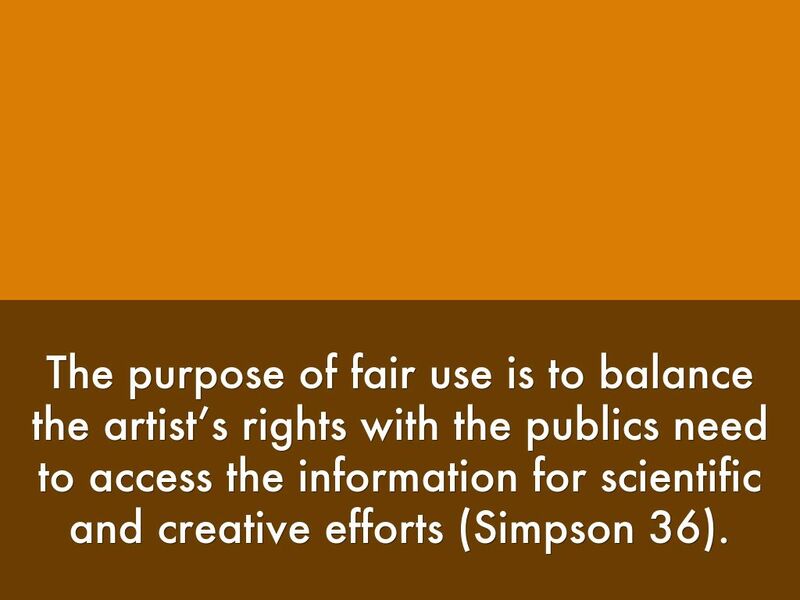 The purpose of fair use is to balance the artist’s rights with the publics need to access the information for scientific and creative efforts (Simpson 36). 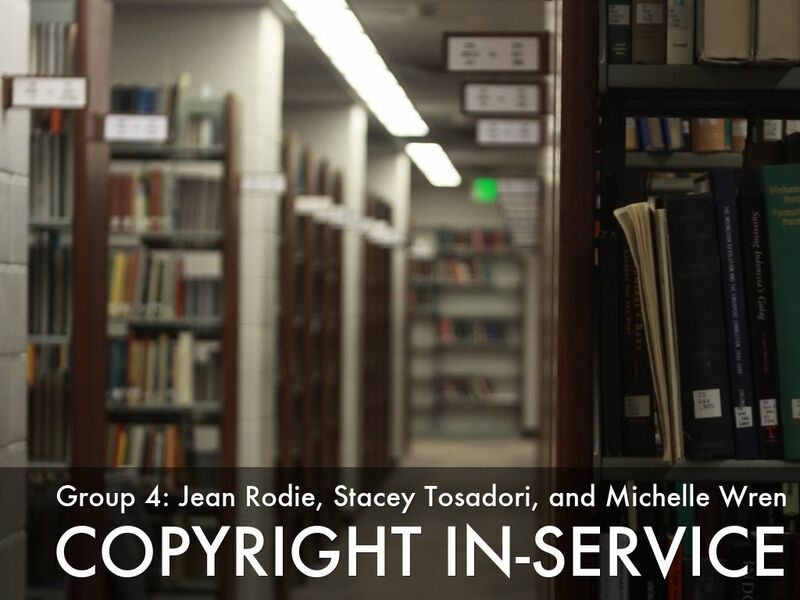 Fair use grants provisional permission for users to use and reproduce copyrighted materials as long as the use meets certain guidelines and cite their source (Simpson 36). 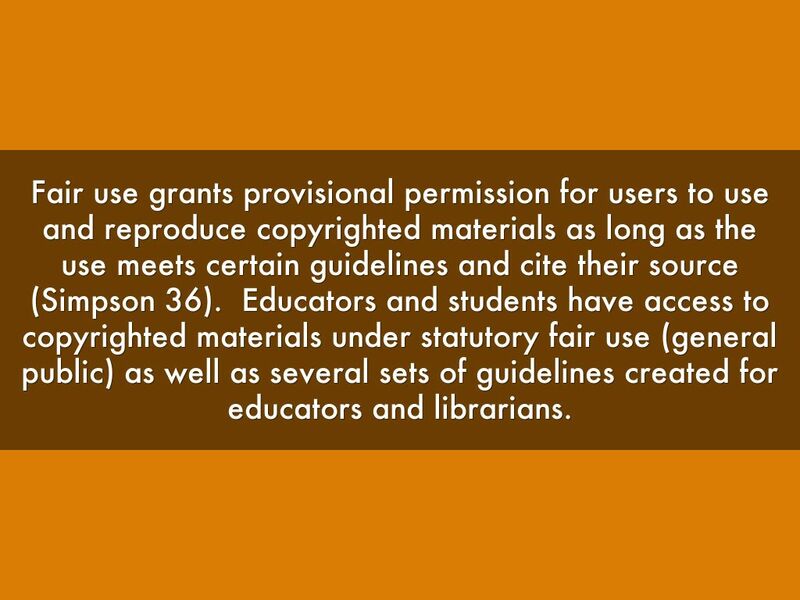 Educators and students have access to copyrighted materials under statutory fair use (general public) as well as several sets of guidelines created for educators and librarians. 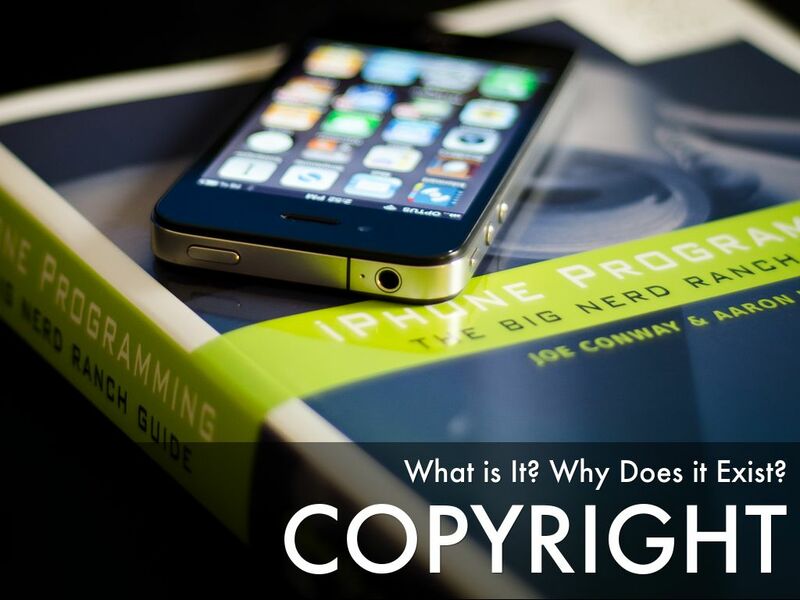 The easiest way to comply with the Copyright Act is to follow the law and its guidelines. 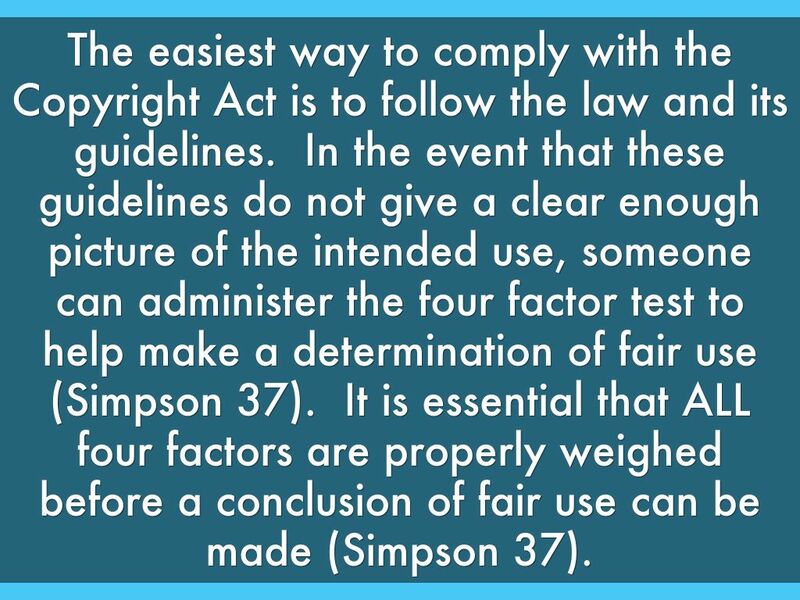 In the event that these guidelines do not give a clear enough picture of the intended use, someone can administer the four factor test to help make a determination of fair use (Simpson 37). 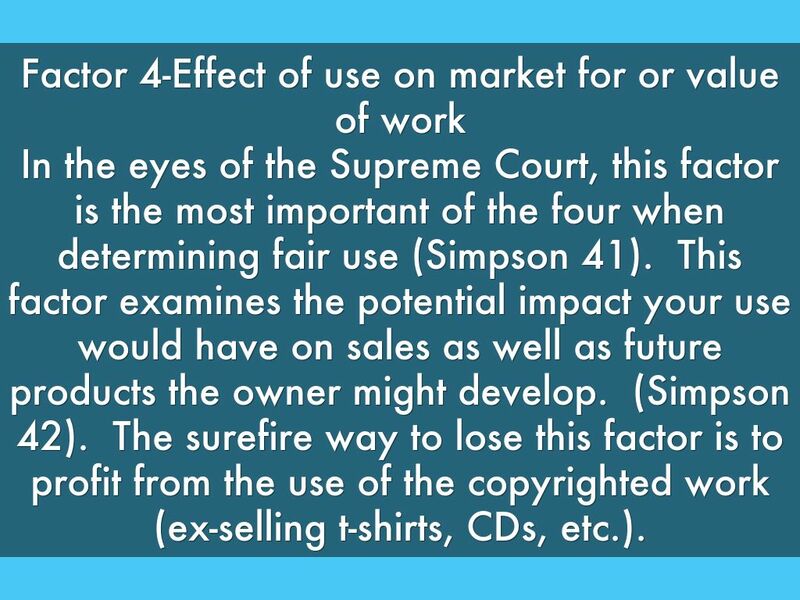 It is essential that ALL four factors are properly weighed before a conclusion of fair use can be made (Simpson 37). The first factor essentially determines who is using the material and for what purpose including commercial endeavors or nonprofit educational use. 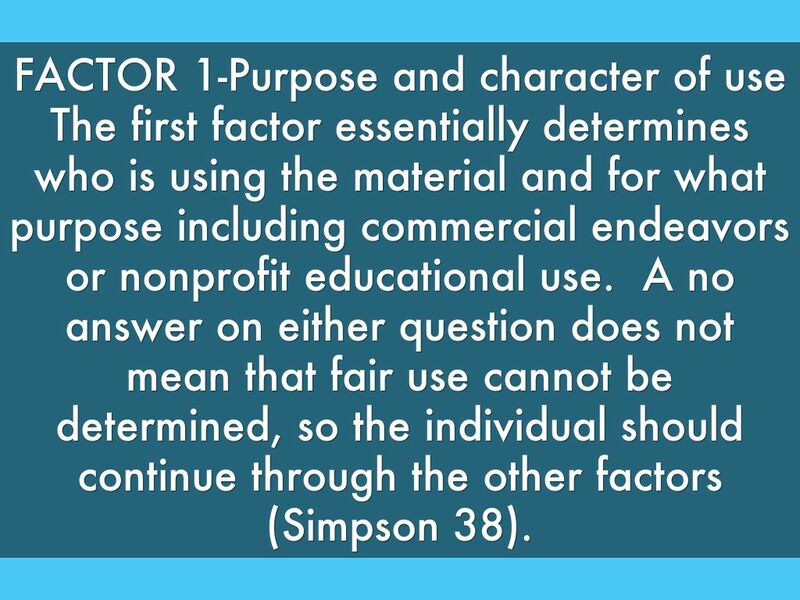 A no answer on either question does not mean that fair use cannot be determined, so the individual should continue through the other factors (Simpson 38). Part 1-Is the use for a nonprofit educational use? 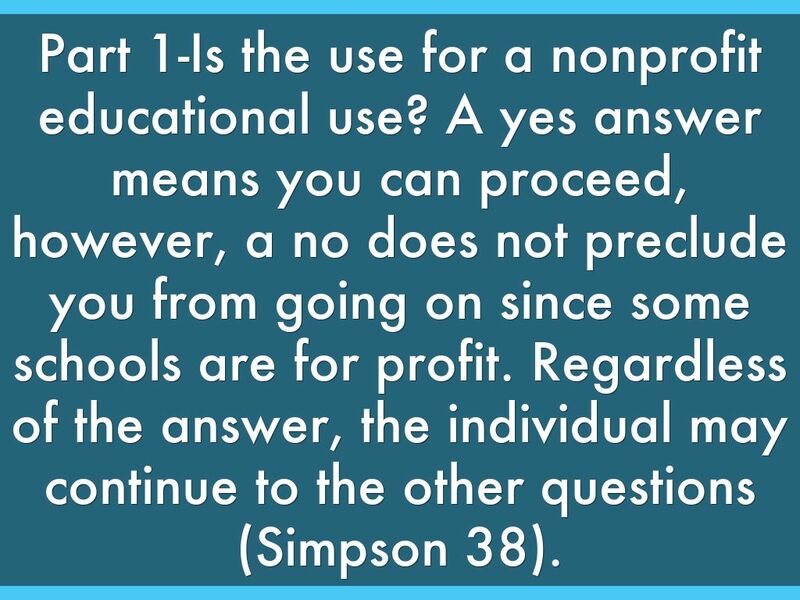 A yes answer means you can proceed, however, a no does not preclude you from going on since some schools are for profit. Regardless of the answer, the individual may continue to the other questions (Simpson 38). 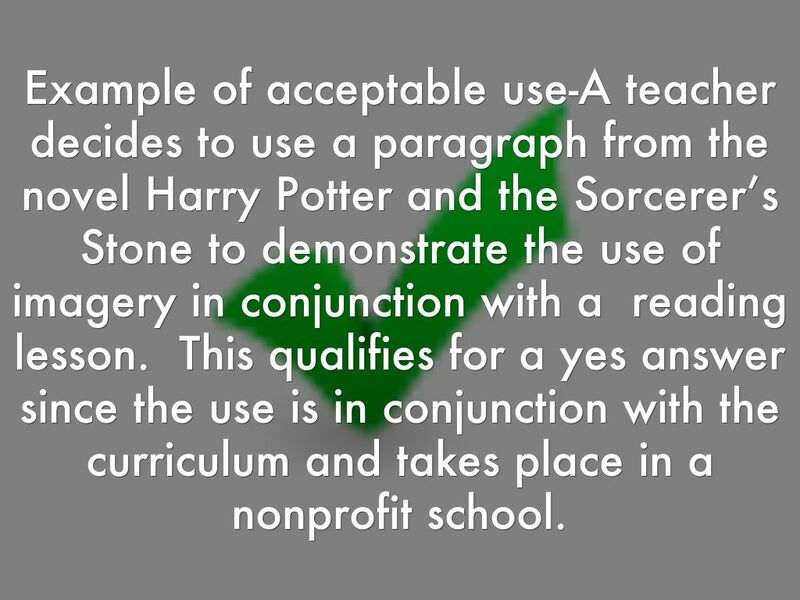 Example of acceptable use-A teacher decides to use a paragraph from the novel Harry Potter and the Sorcerer’s Stone to demonstrate the use of imagery in conjunction with a reading lesson. This qualifies for a yes answer since the use is in conjunction with the curriculum and takes place in a nonprofit school. 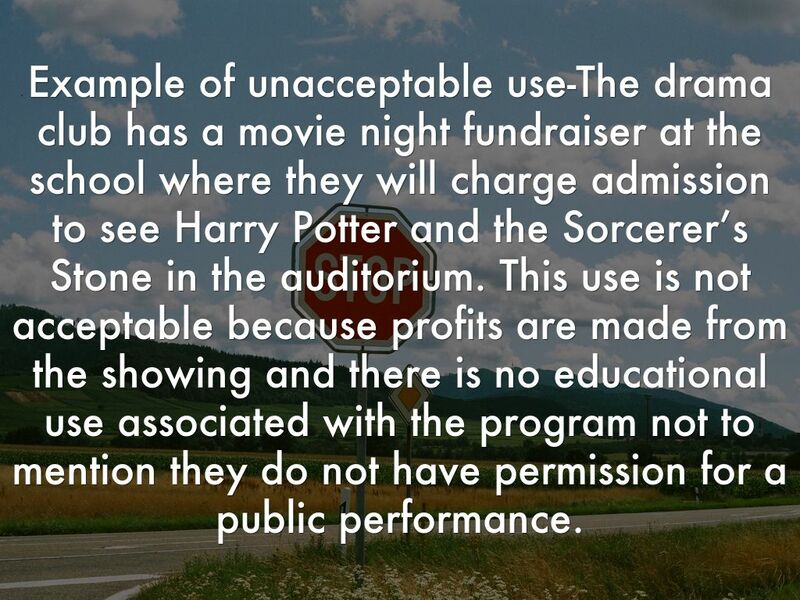 Example of unacceptable use-The drama club has a movie night fundraiser at the school where they will charge admission to see Harry Potter and the Sorcerer’s Stone in the auditorium. This use is not acceptable because profits are made from the showing and there is no educational use associated with the program not to mention they do not have permission for a public performance. part of a news program? 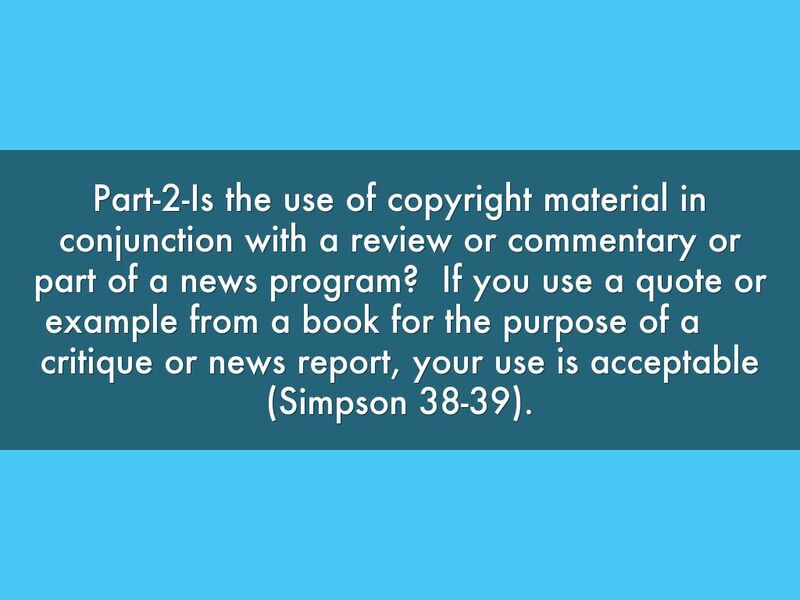 If you use a quote or example from a book for the purpose of a critique or news report, your use is acceptable (Simpson 38-39). 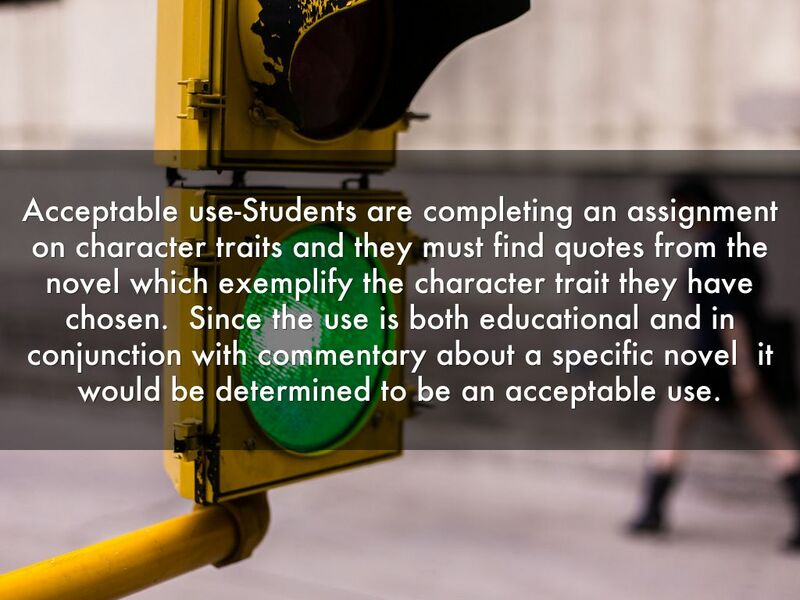 Acceptable use-Students are completing an assignment on character traits and they must find quotes from the novel which exemplify the character trait they have chosen. Since the use is both educational and in conjunction with commentary about a specific novel it would be determined to be an acceptable use. 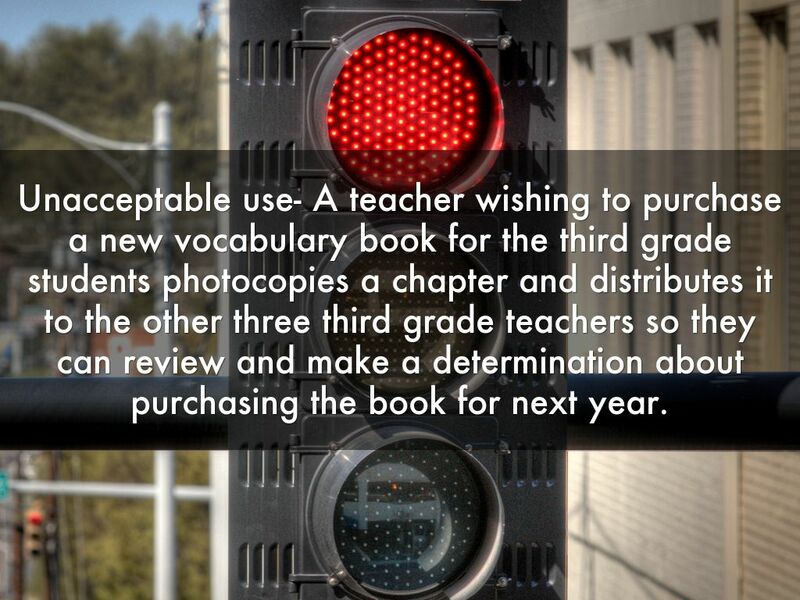 Unacceptable use- A teacher wishing to purchase a new vocabulary book for the third grade students photocopies a chapter and distributes it to the other three third grade teachers so they can review and make a determination about purchasing the book for next year. 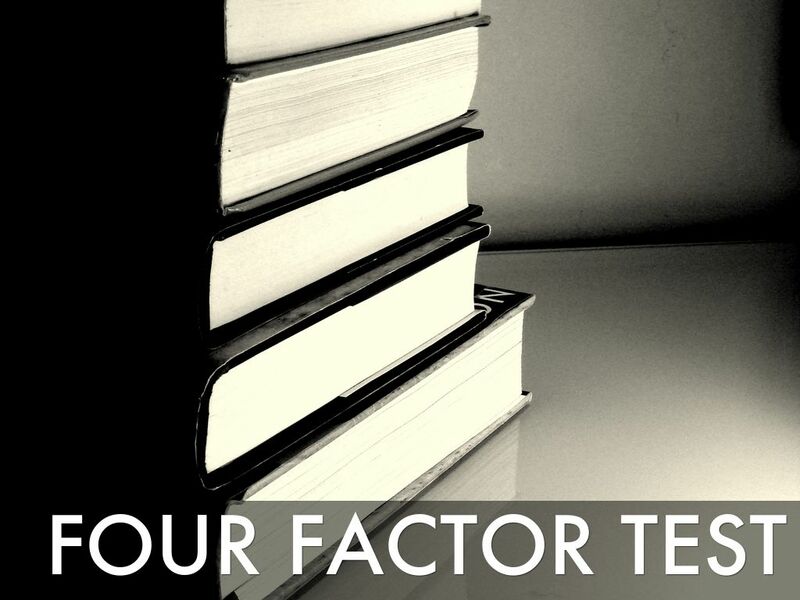 Factor two also has two questions pertaining to the use. Having both questions on your side strengthens your case, but negative answers on either does not ruin your argument for fair use (Simpson 39). Part 1-Is the work strictly fact or does it exhibit creative thought? Facts are not protected under copyright, but an author’s individual expression of the facts is protected (Simpson 39). 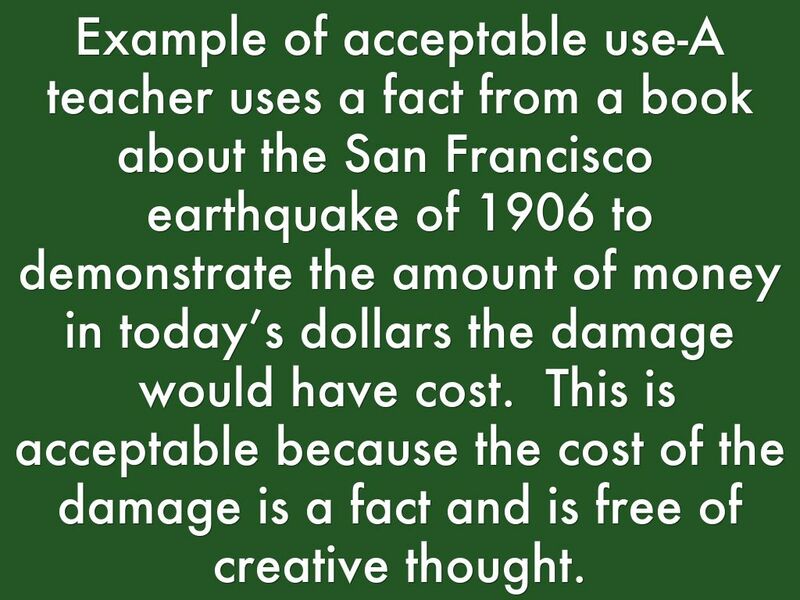 Example of acceptable use-A teacher uses a fact from a book about the San Francisco earthquake of 1906 to demonstrate the amount of money in today’s dollars the damage would have cost. This is acceptable because the cost of the damage is a fact and is free of creative thought. Example of unacceptable use-The same teacher using the same book, photocopied the first person accounts so each student would have their own copy to read. This example is unacceptable because the teacher took the creative expression of the author and copied and distributed it without permission. Part 2-Is the work published? Non-published works are given more protections than works which are published because it is clear the author did not wish to share their work with the public (Simpson 39). 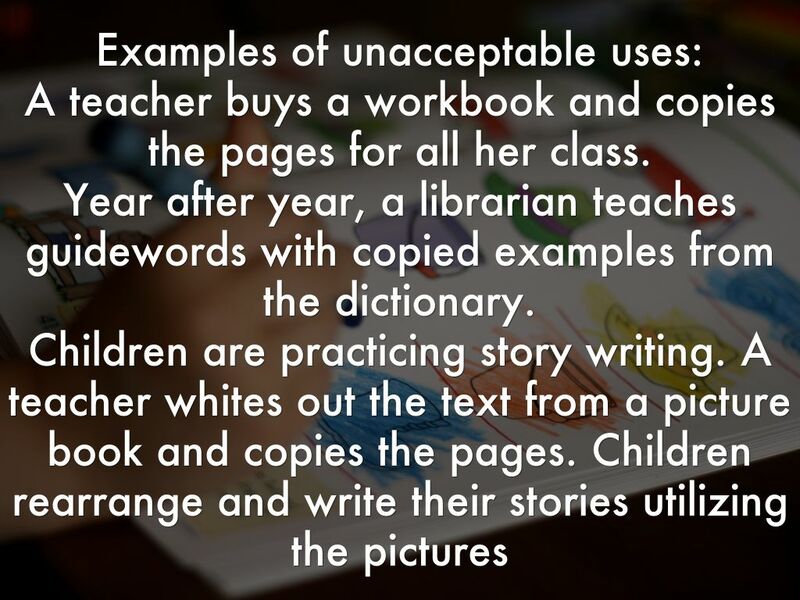 Acceptable use-A teacher purchases the published work of another teacher with the author’s permission to use the work in their classroom. 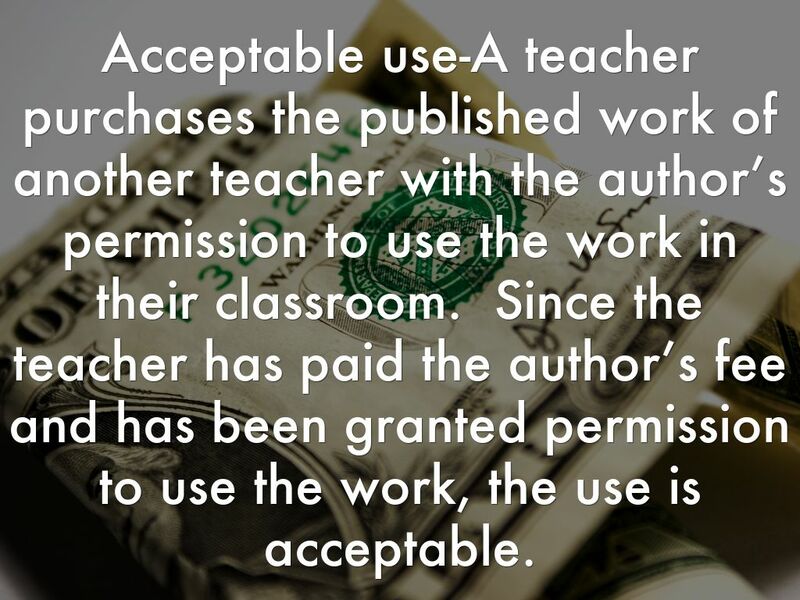 Since the teacher has paid the author’s fee and has been granted permission to use the work, the use is acceptable. 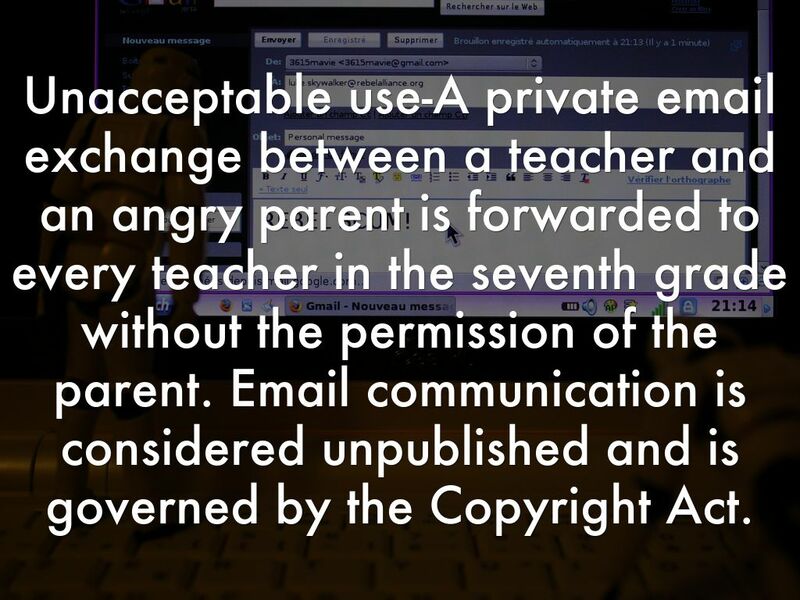 Unacceptable use-A private email exchange between a teacher and an angry parent is forwarded to every teacher in the seventh grade without the permission of the parent. Email communication is considered unpublished and is governed by the Copyright Act. Factor 3-Amount of work used? 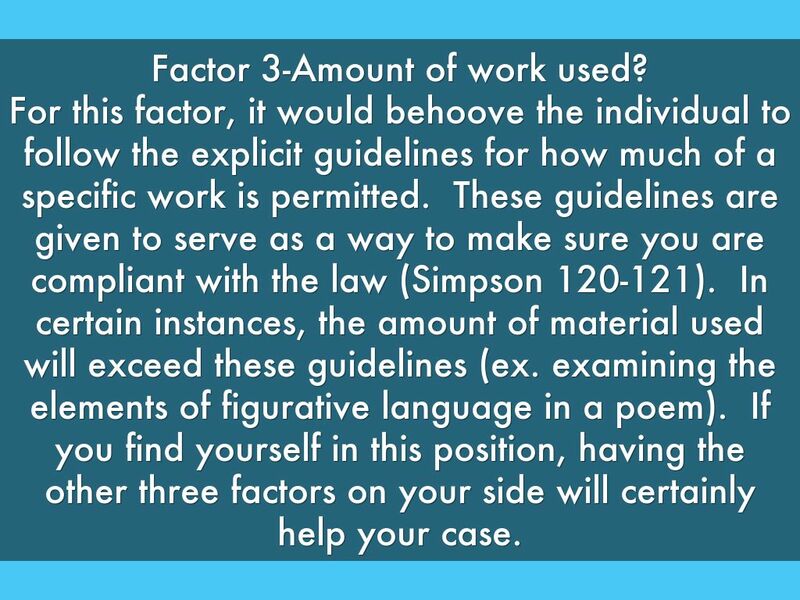 For this factor, it would behoove the individual to follow the explicit guidelines for how much of a specific work is permitted. These guidelines are given to serve as a way to make sure you are compliant with the law (Simpson 120-121). In certain instances, the amount of material used will exceed these guidelines (ex. examining the elements of figurative language in a poem). If you find yourself in this position, having the other three factors on your side will certainly help your case. Acceptable use-Each student is given a copy of a wordless picture book and instructed to create dialogue for two pages to practice proper punctuation. 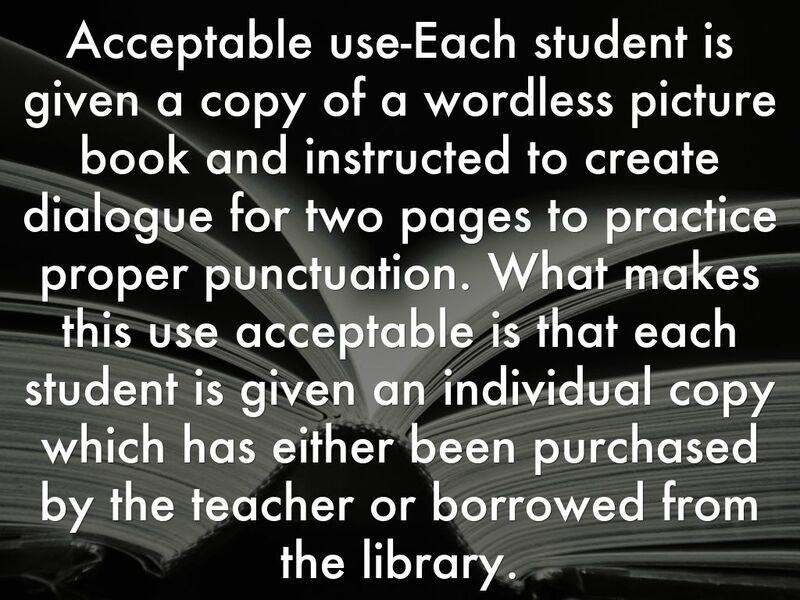 What makes this use acceptable is that each student is given an individual copy which has either been purchased by the teacher or borrowed from the library. 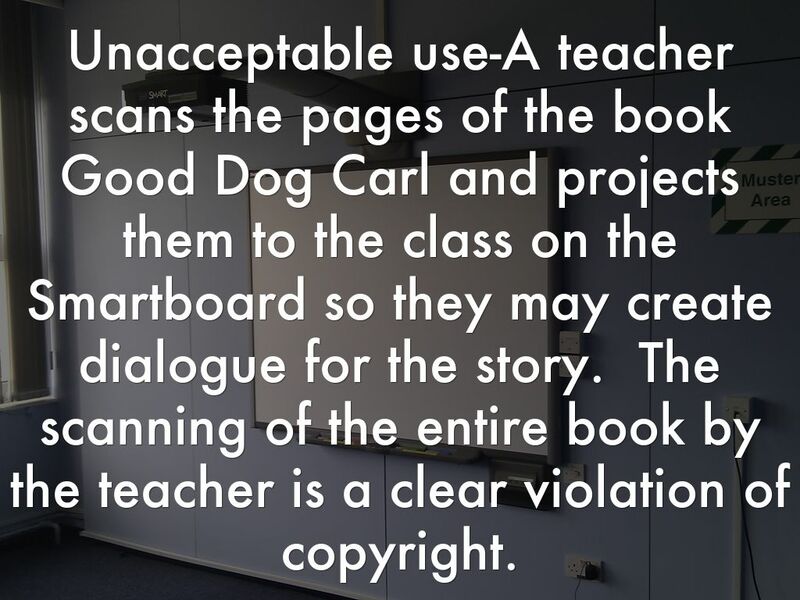 Unacceptable use-A teacher scans the pages of the book Good Dog Carl and projects them to the class on the Smartboard so they may create dialogue for the story. The scanning of the entire book by the teacher is a clear violation of copyright. In the eyes of the Supreme Court, this factor is the most important of the four when determining fair use (Simpson 41). This factor examines the potential impact your use would have on sales as well as future products the owner might develop. (Simpson 42). The surefire way to lose this factor is to profit from the use of the copyrighted work (ex-selling t-shirts, CDs, etc.). 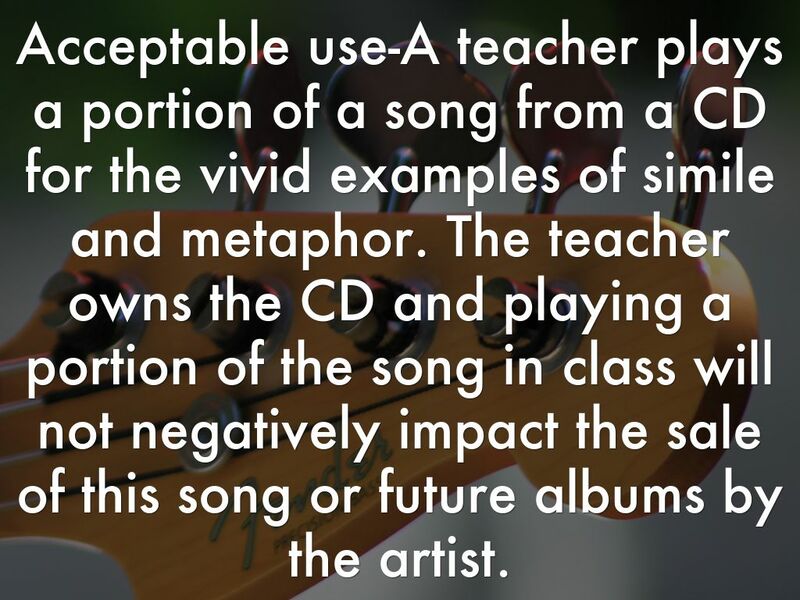 Acceptable use-A teacher plays a portion of a song from a CD for the vivid examples of simile and metaphor. The teacher owns the CD and playing a portion of the song in class will not negatively impact the sale of this song or future albums by the artist. 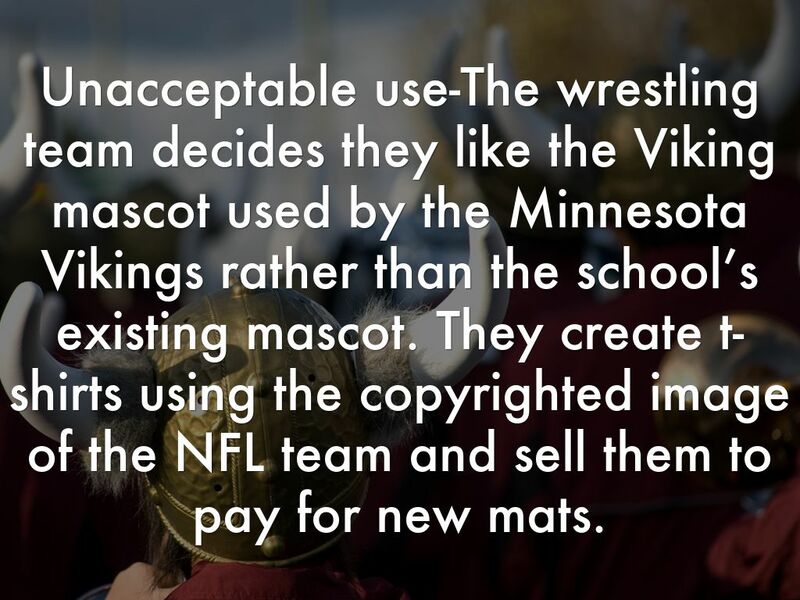 Unacceptable use-The wrestling team decides they like the Viking mascot used by the Minnesota Vikings rather than the school’s existing mascot. They create t-shirts using the copyrighted image of the NFL team and sell them to pay for new mats. 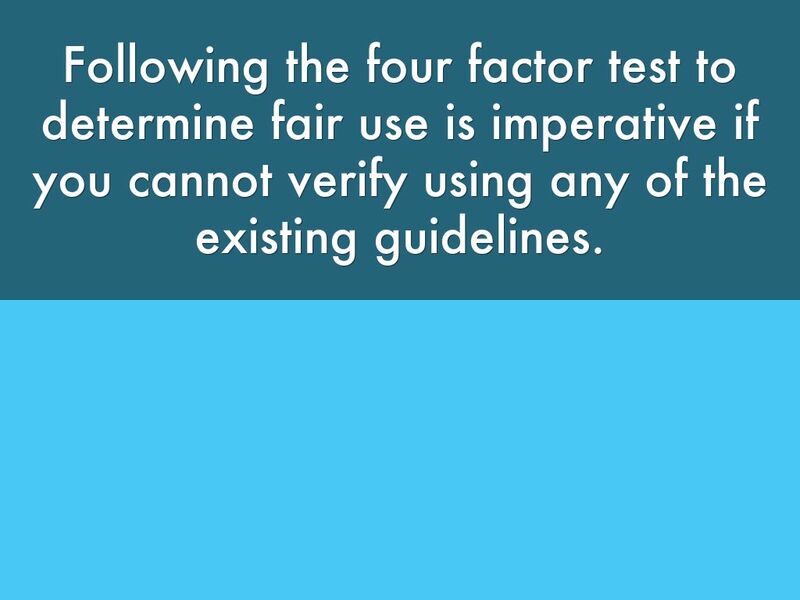 Following the four factor test to determine fair use is imperative if you cannot verify using any of the existing guidelines. 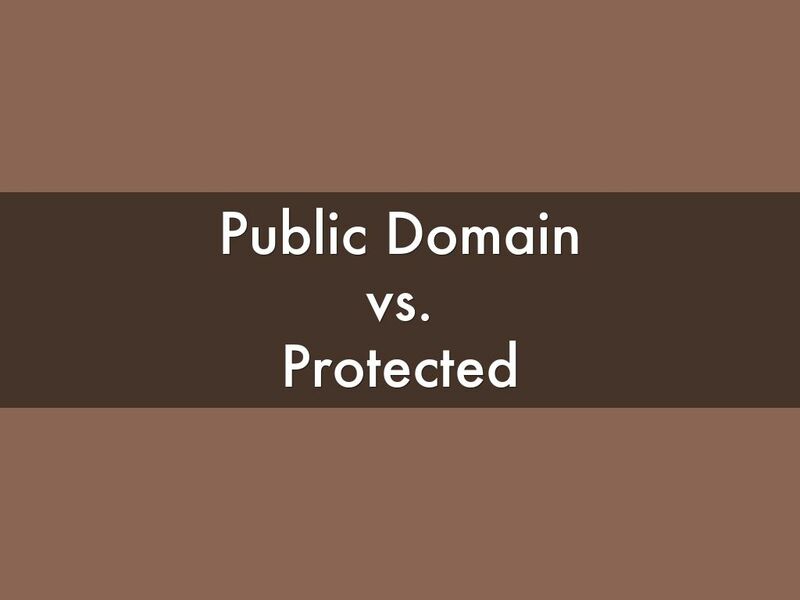 Public domain materials are allowed to be used by anyone for any purpose! 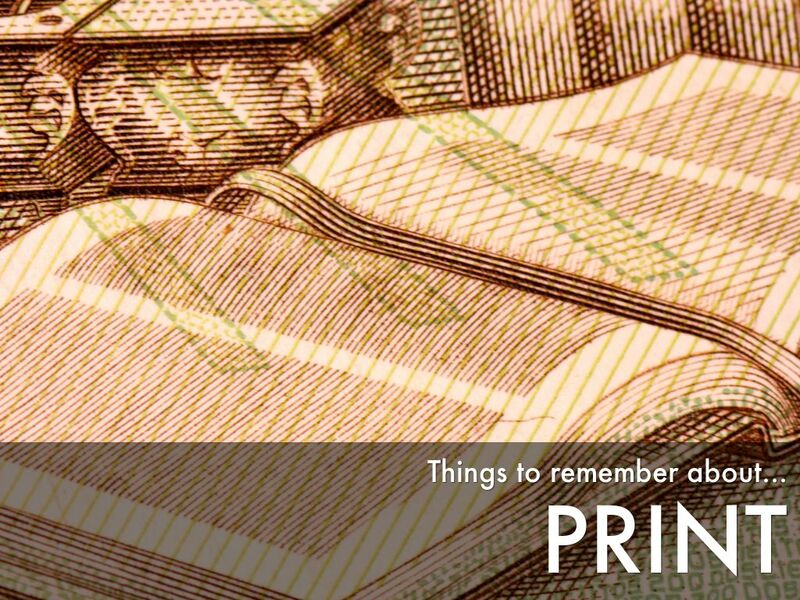 The first and foremost concern for print is the publishing date. If the teacher’s material was published before 1923, it belongs in the public domain. Any work that was published after1923 and before 1976 and has not been properly registered is in the public domain. Works published after 1976 and registered properly from1924 through 1975 are protected. Protected materials have restrictions of use. Single copy seems to be the rule! Poetry: A poem can be completely copied if less than 250 words. A poem over 250 words can be copied up to 250 words. Prose: Articles, stories, and essays consisting of 2,500 or words or less can be copied in their entirety. Plays, letters, and novels can be copied up to 500 words (least) up to 10% of the entirety of the work. 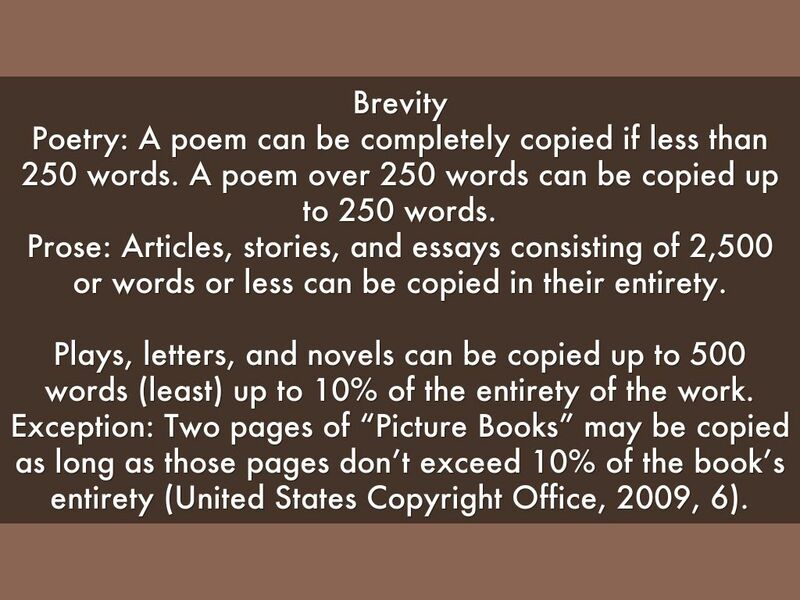 Exception: Two pages of “Picture Books” may be copied as long as those pages don’t exceed 10% of the book’s entirety (United States Copyright Office, 2009, 6). The situation is reflective of a teacher’s spur of the moment development of a lesson plan. The same work cannot be used in subsequent semesters (United States Copyright Office, 2009, 6). 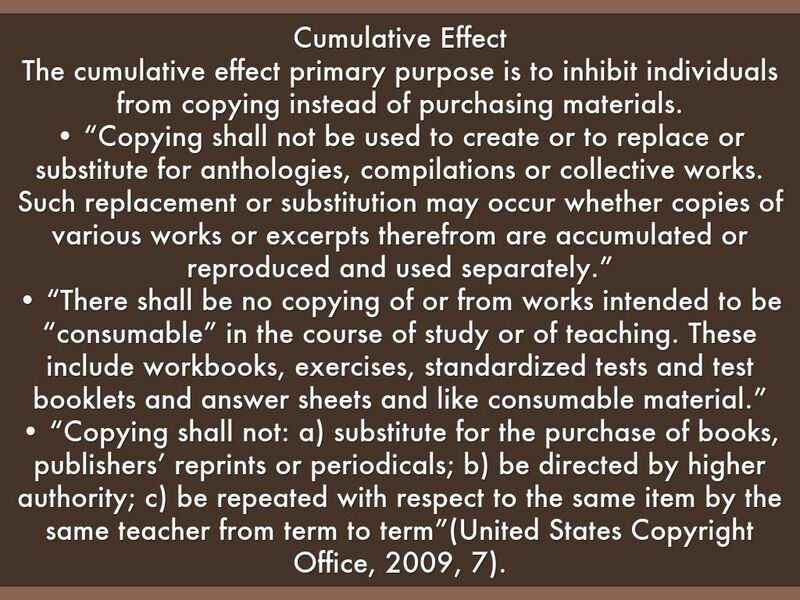 The cumulative effect primary purpose is to inhibit individuals from copying instead of purchasing materials. 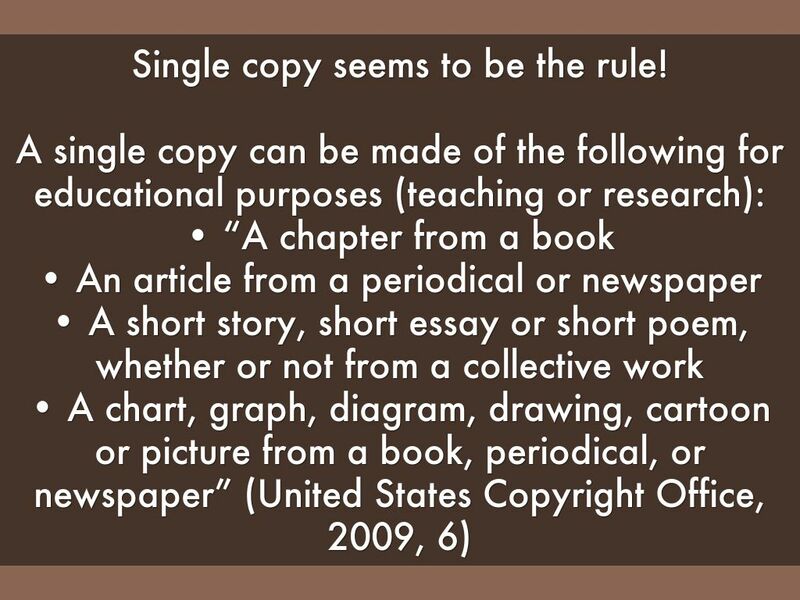 •	“Copying shall not: a) substitute for the purchase of books, publishers’ reprints or periodicals; b) be directed by higher authority; c) be repeated with respect to the same item by the same teacher from term to term”(United States Copyright Office, 2009, 7). One exact copy (without modifications) can be made of one graph, diagram, chart, drawing, cartoon, or picture (United States Copyright Office, 2009). 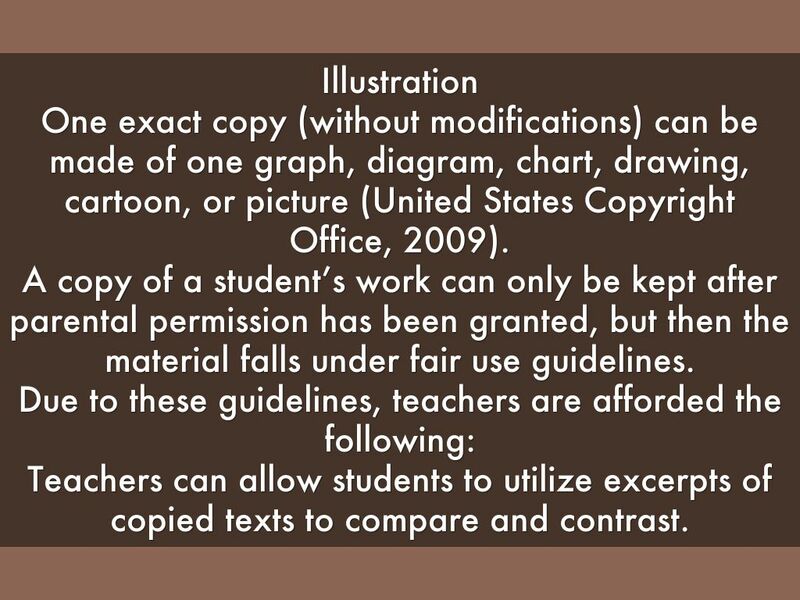 A copy of a student’s work can only be kept after parental permission has been granted, but then the material falls under fair use guidelines. Teachers can allow students to utilize excerpts of copied texts to compare and contrast. Acceptable examples of uses: Teachers find themselves at the beginning of the year short two textbooks. The textbooks have been ordered, but the teachers make two copies of the upcoming chapter to “get them through” until the textbooks arrive. 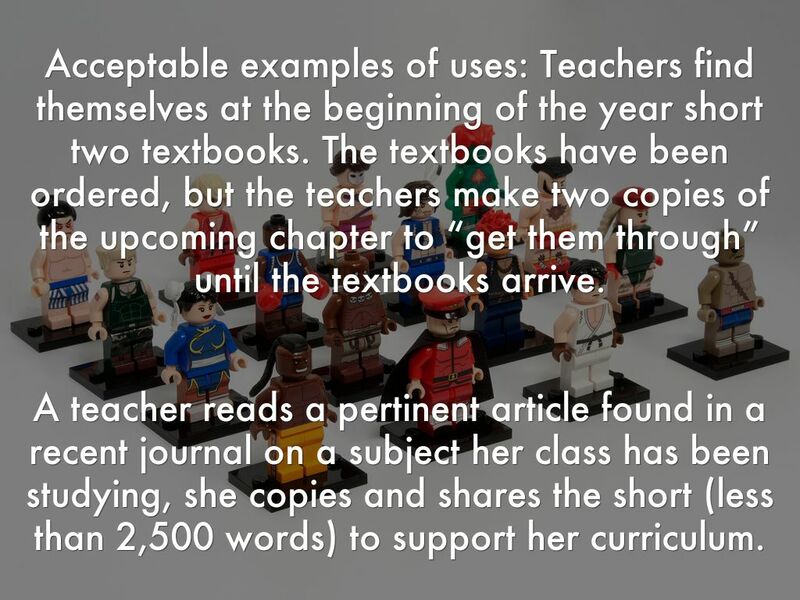 A teacher reads a pertinent article found in a recent journal on a subject her class has been studying, she copies and shares the short (less than 2,500 words) to support her curriculum. A teacher buys a workbook and copies the pages for all her class. Year after year, a librarian teaches guidewords with copied examples from the dictionary. 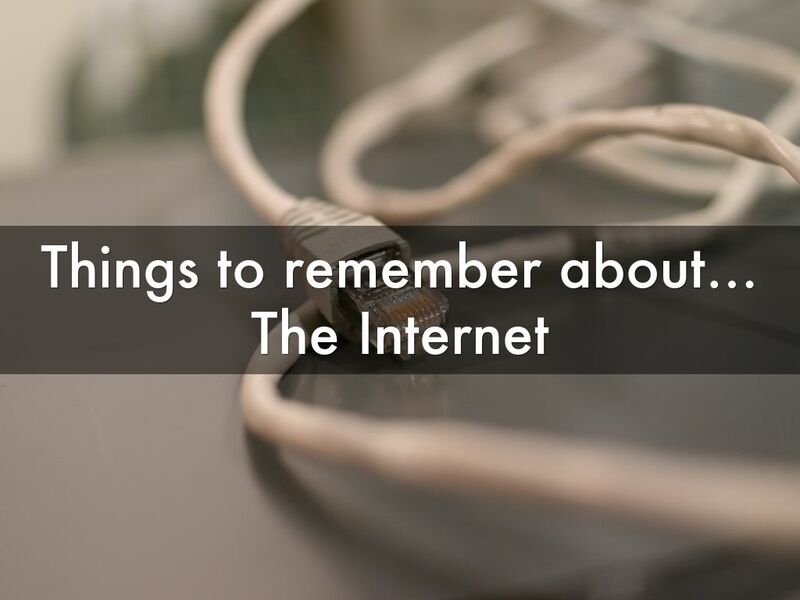 Audio refers to records, compact discs, cassette tapes, and audio clips from the web. 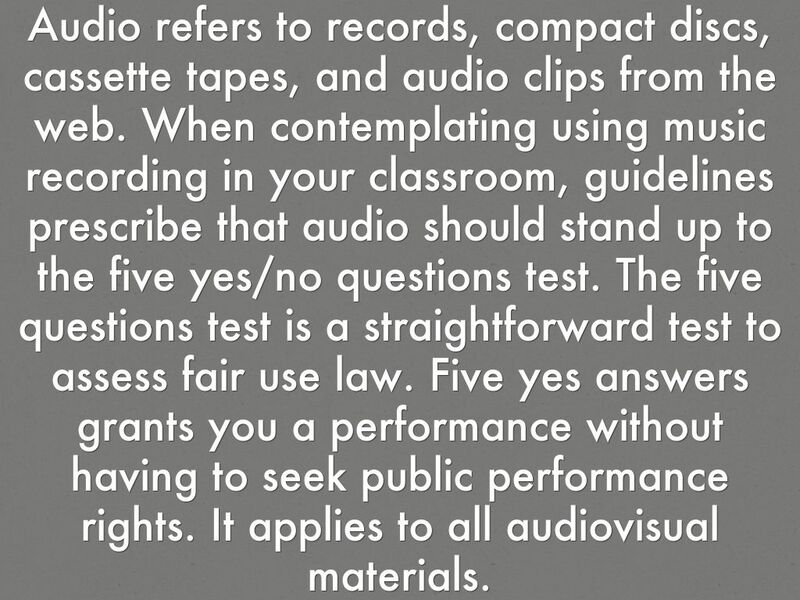 When contemplating using music recording in your classroom, guidelines prescribe that audio should stand up to the five yes/no questions test. The five questions test is a straightforward test to assess fair use law. 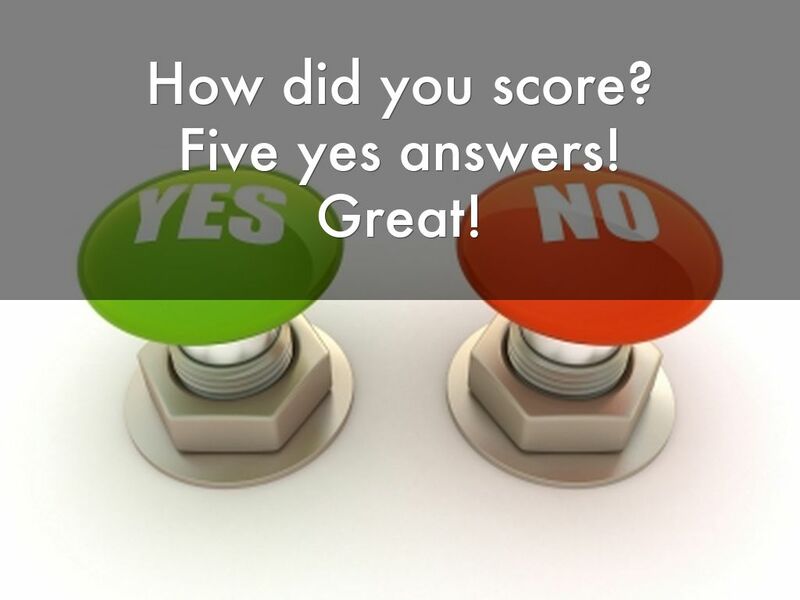 Five yes answers grants you a performance without having to seek public performance rights. It applies to all audiovisual materials. 1. 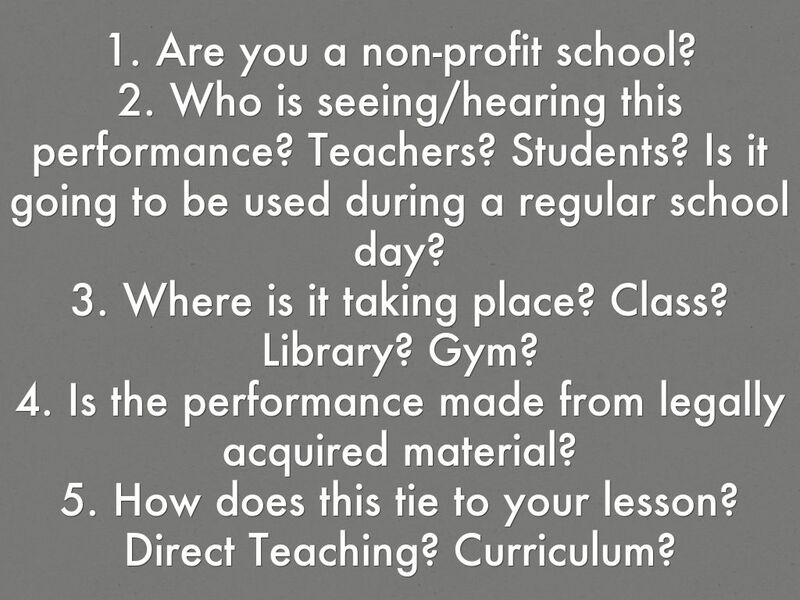 Are you a non-profit school? 2.	Who is seeing/hearing this performance? Teachers? Students? Is it going to be used during a regular school day? 3. Where is it taking place? Class? Library? Gym? 4. Is the performance made from legally acquired material? 5. How does this tie to your lesson? Direct Teaching? Curriculum? 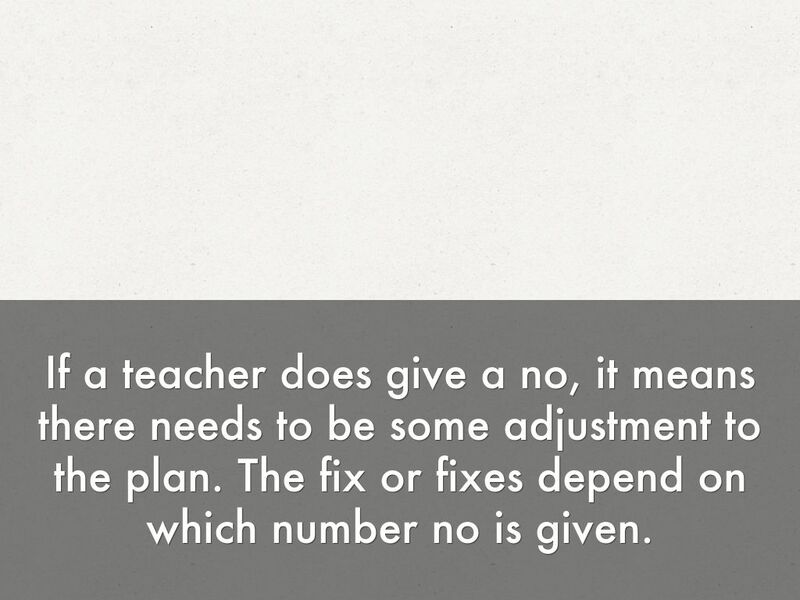 If a teacher does give a no, it means there needs to be some adjustment to the plan. The fix or fixes depend on which number no is given. 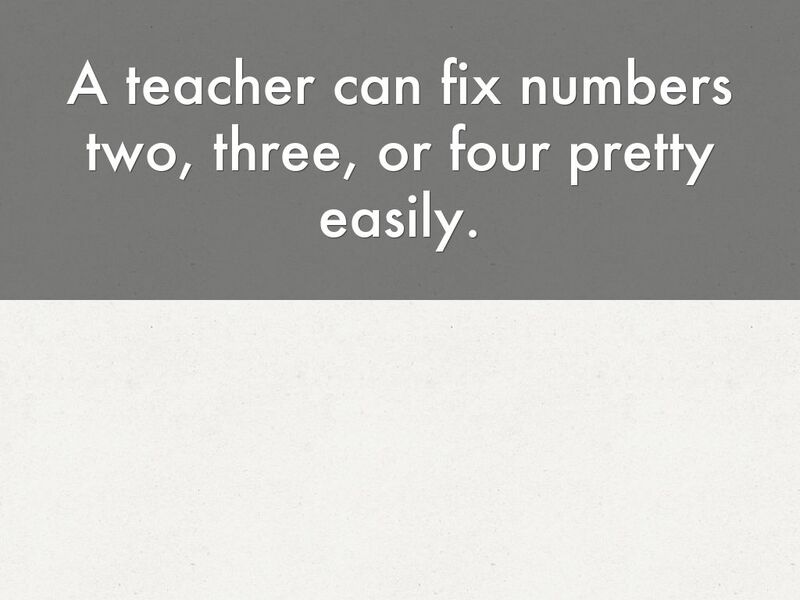 A teacher can fix numbers two, three, or four pretty easily. Teachers can make sure they share the performance only to students and teachers. He/she can show only in instructional places. He/she can acquire a legal copy of material. Renting, borrowing, or purchasing are all valid avenues. 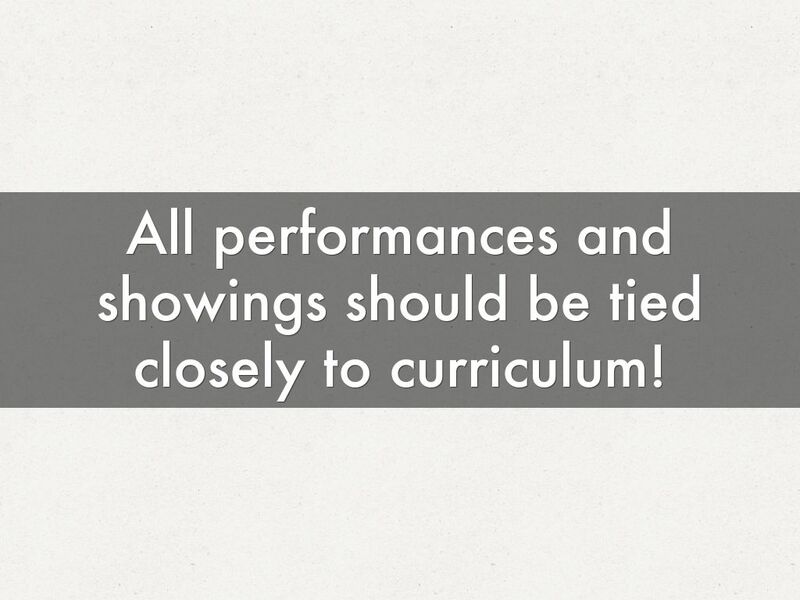 All performances and showings should be tied closely to curriculum! 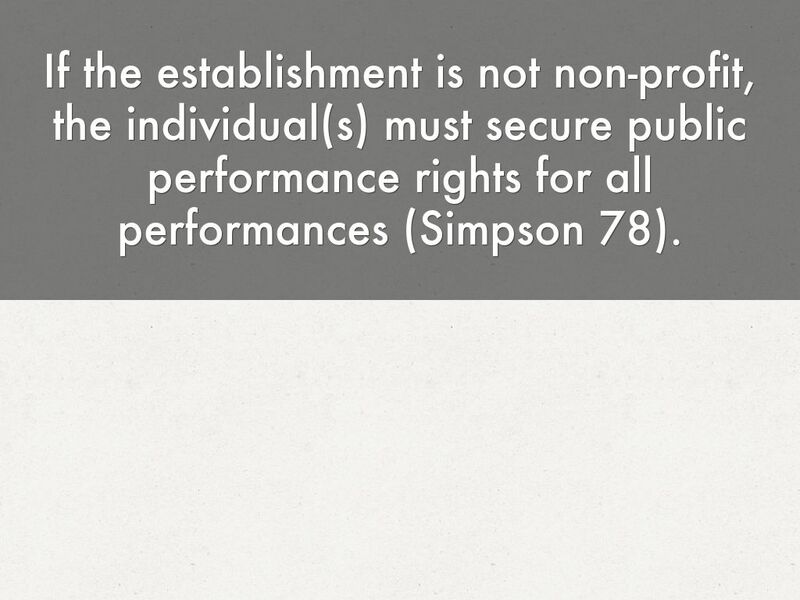 If the establishment is not non-profit, the individual(s) must secure public performance rights for all performances (Simpson 78). 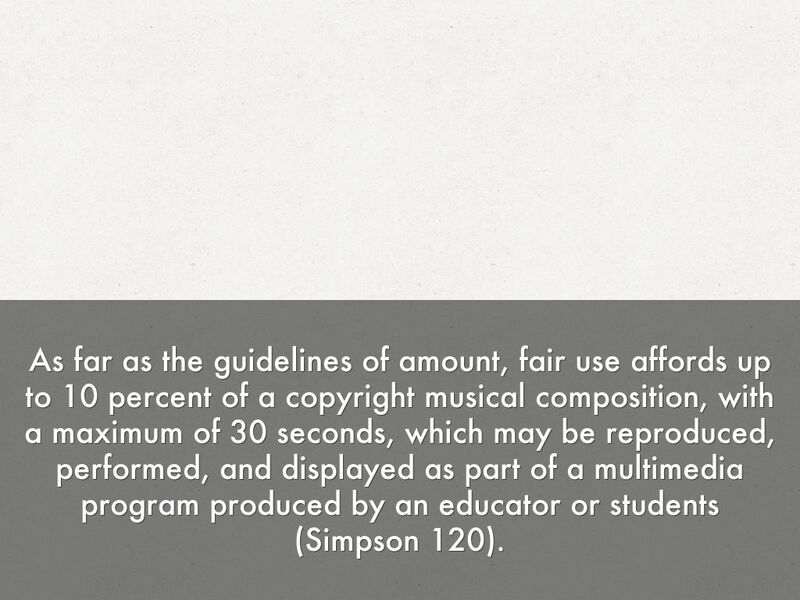 As far as the guidelines of amount, fair use affords up to 10 percent of a copyright musical composition, with a maximum of 30 seconds, which may be reproduced, performed, and displayed as part of a multimedia program produced by an educator or students (Simpson 120). The teacher assigns a multimedia assignment where students have to create a presentation of their favorite books. 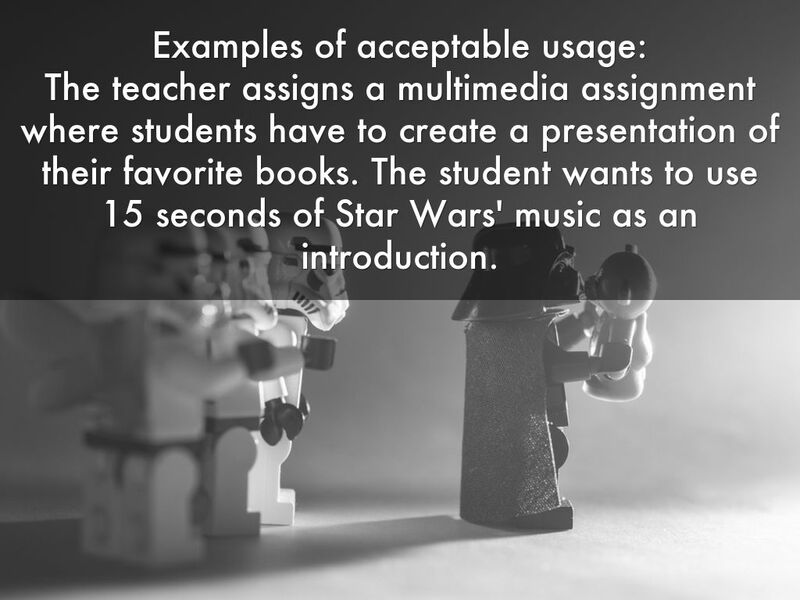 The student wants to use 15 seconds of Star Wars' music as an introduction. 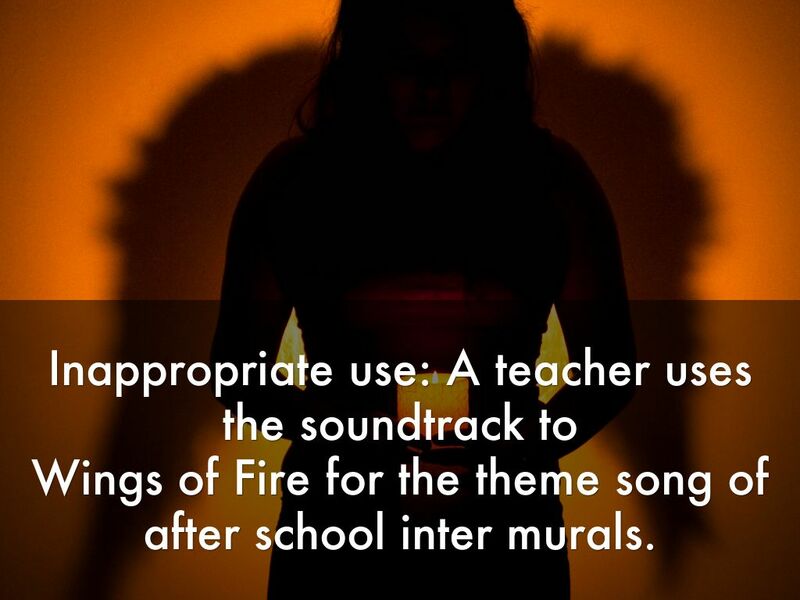 Wings of Fire for the theme song of after school inter murals. 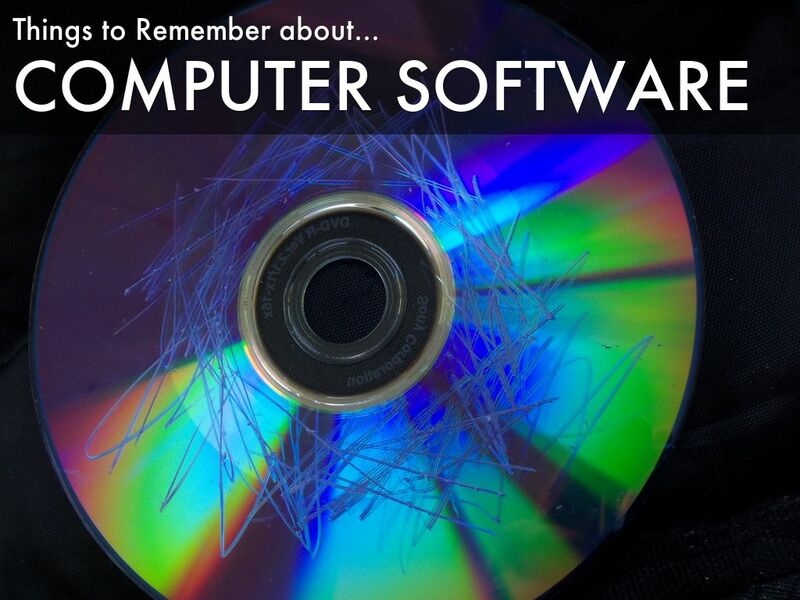 Computer and networking software are not only protected by copyright laws, but with licensing agreements as well. 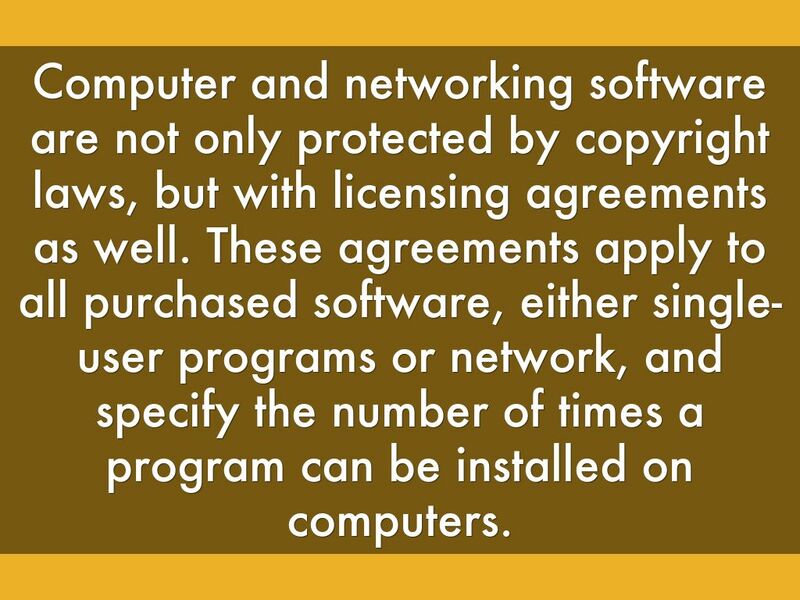 These agreements apply to all purchased software, either single-user programs or network, and specify the number of times a program can be installed on computers. 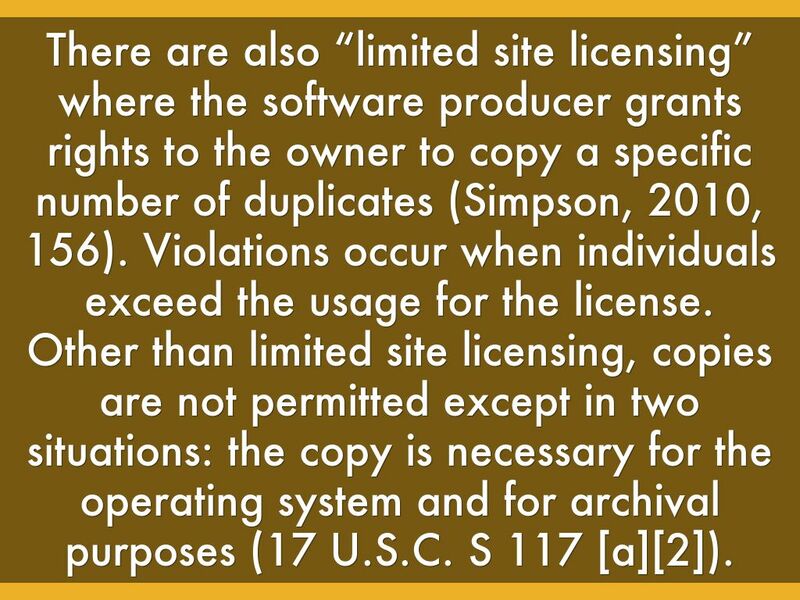 There are also “limited site licensing” where the software producer grants rights to the owner to copy a specific number of duplicates (Simpson, 2010, 156). 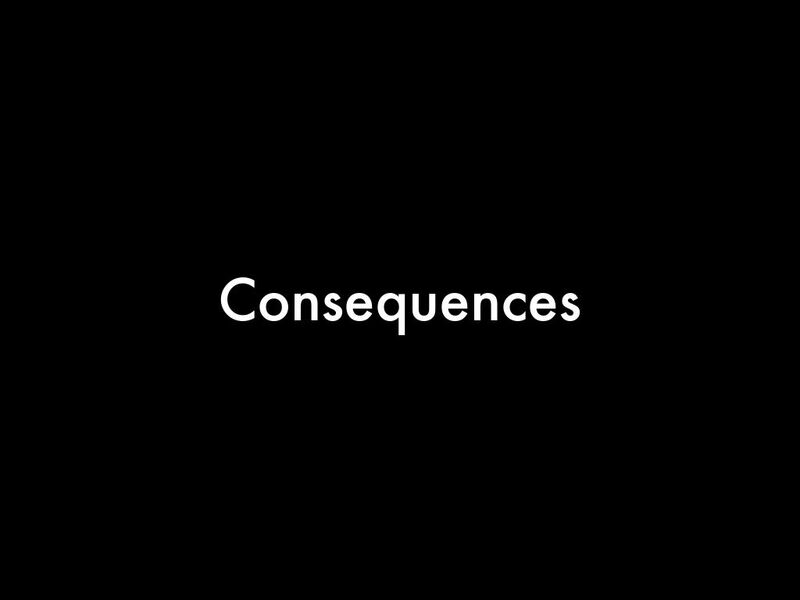 Violations occur when individuals exceed the usage for the license. Other than limited site licensing, copies are not permitted except in two situations: the copy is necessary for the operating system and for archival purposes (17 U.S.C. S 117 [a]). Other types of software can be freely copied and used without any agreements. 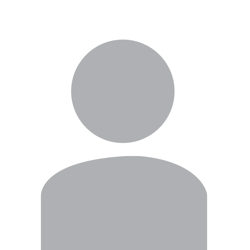 Public Domain –Individuals may feel free to download and use as they would like. 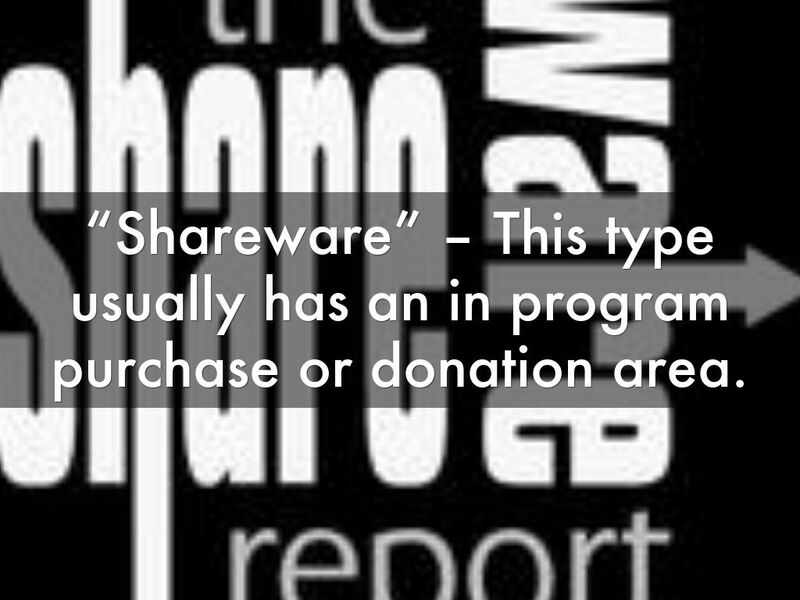 “Shareware” – This type usually has an in program purchase or donation area. 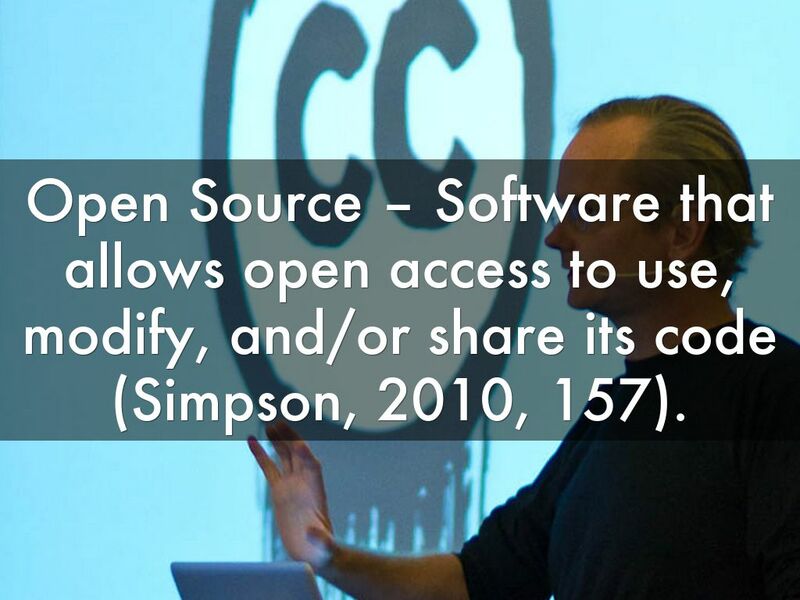 Open Source – Software that allows open access to use, modify, and/or share its code (Simpson, 2010, 157). A teacher uses a computer program on loan from the library for a specified lesson. 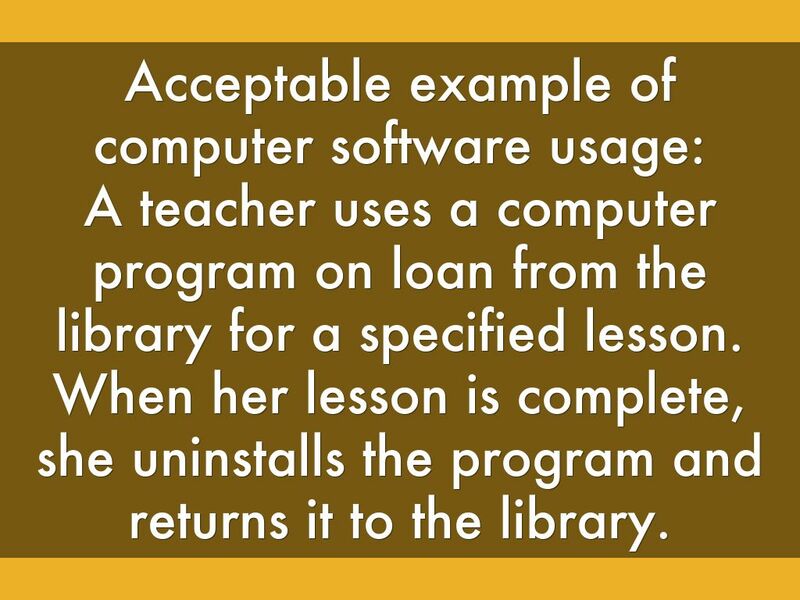 When her lesson is complete, she uninstalls the program and returns it to the library. 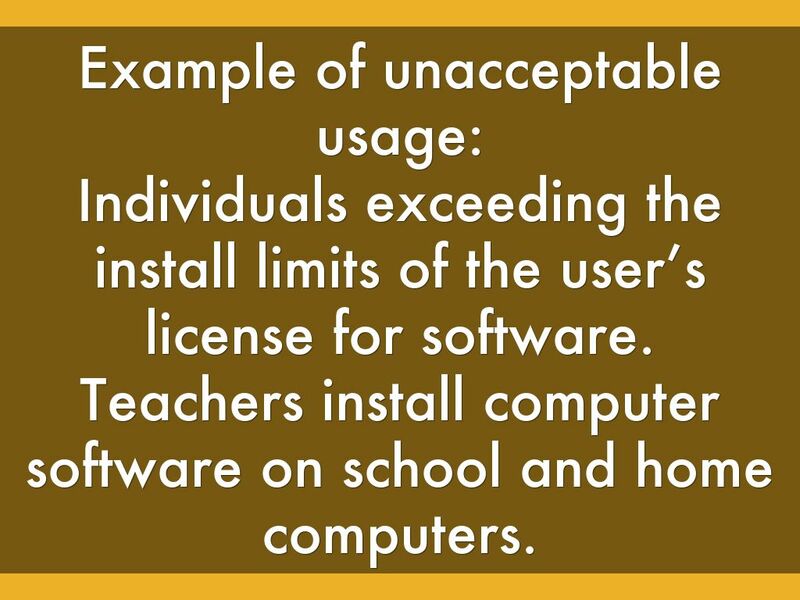 Individuals exceeding the install limits of the user’s license for software. Teachers install computer software on school and home computers. 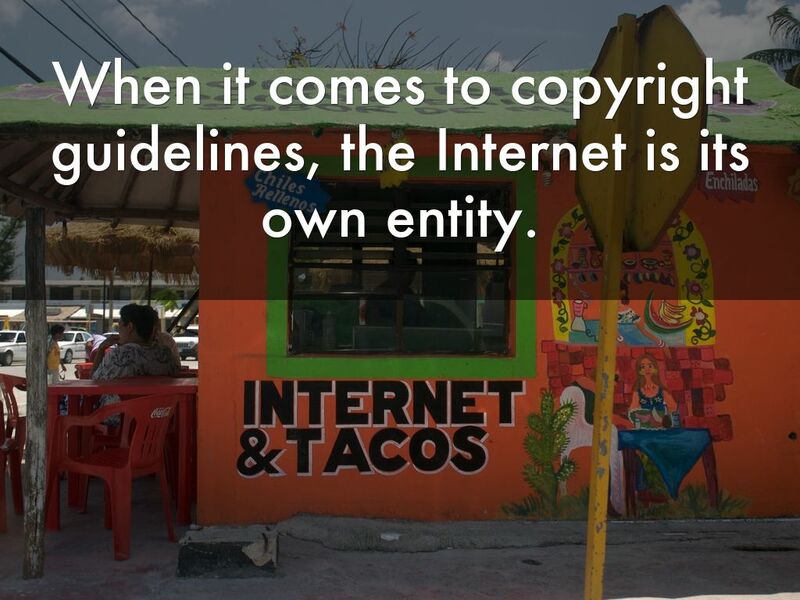 When it comes to copyright guidelines, the Internet is its own entity. 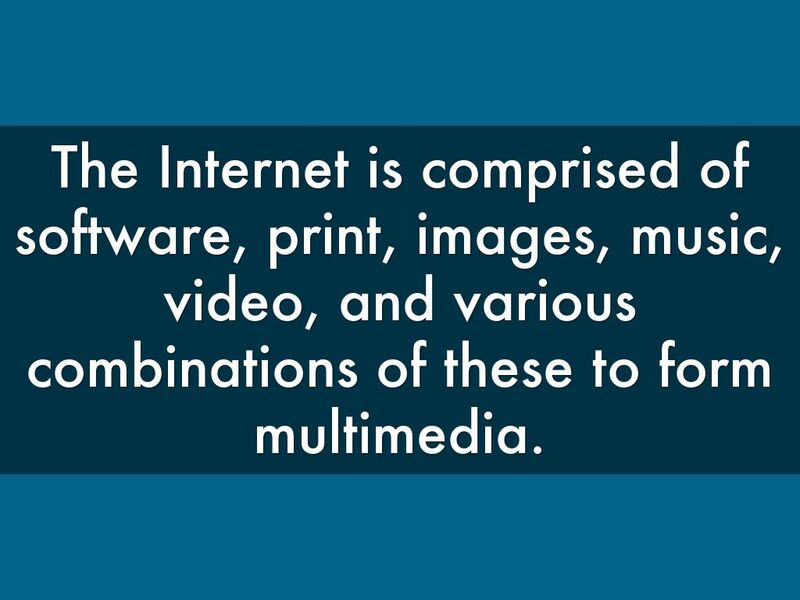 The Internet is comprised of software, print, images, music, video, and various combinations of these to form multimedia. Copyright guidelines revert back to the original standards for the stated resource’s platform, although those do not always “fit”. 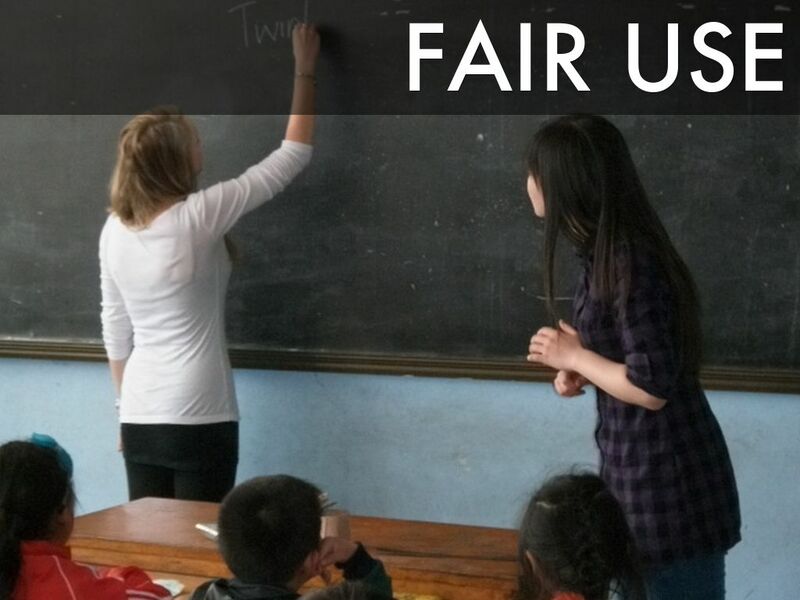 An instructor should apply and practice the four tests of fair use. If the criteria are met, students and teachers can enjoy utilizing web images, sound recordings, and video files for projects and lessons. 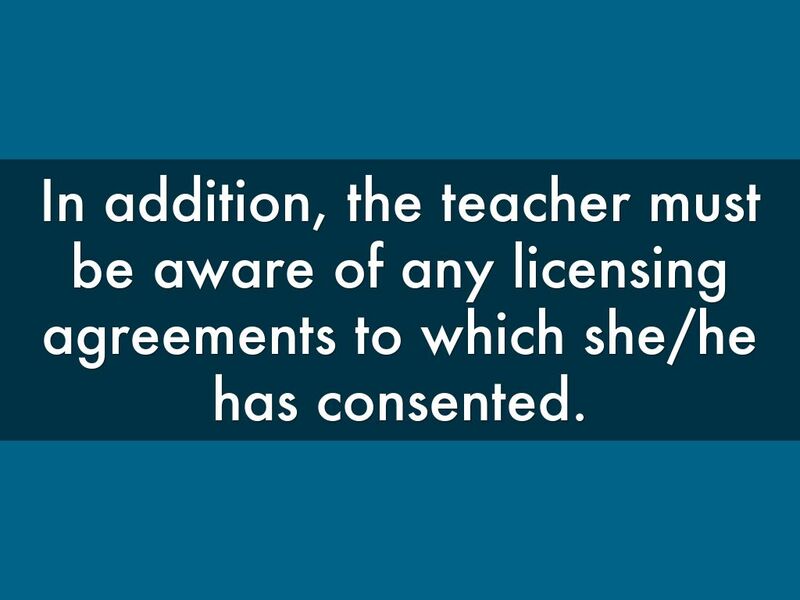 In addition, the teacher must be aware of any licensing agreements to which she/he has consented. An email is considered protected and private. 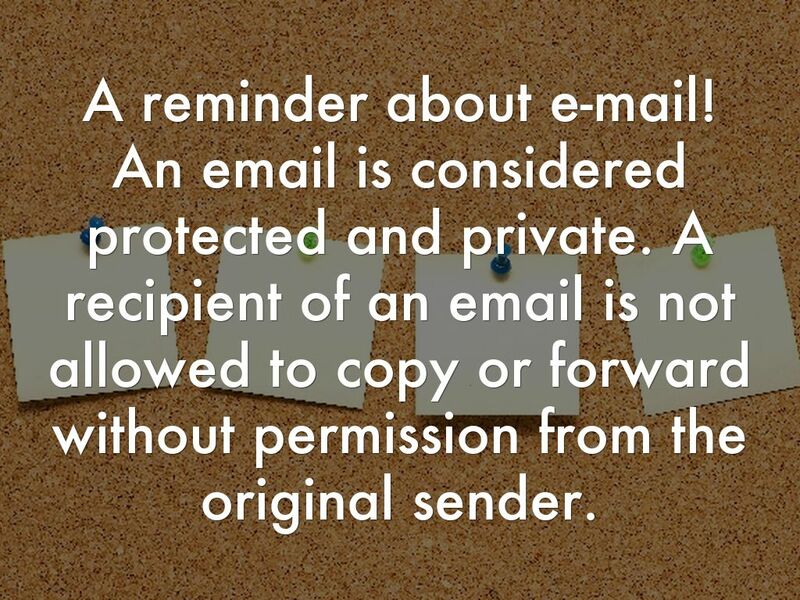 A recipient of an email is not allowed to copy or forward without permission from the original sender. 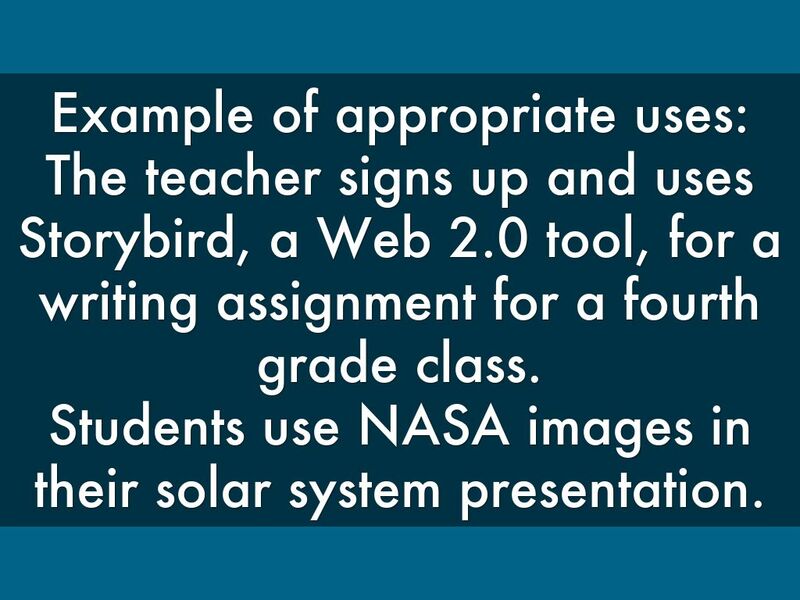 The teacher signs up and uses Storybird, a Web 2.0 tool, for a writing assignment for a fourth grade class. Students use NASA images in their solar system presentation. 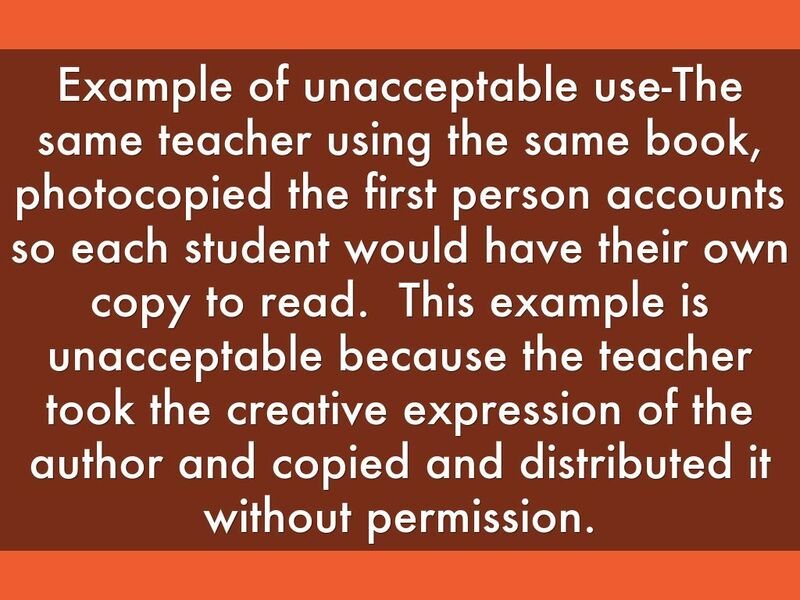 Students copy images from an individual's website and use them in their project without permission. A teacher shares several pages of a website on the promethean board without checking for permission or gaining prior consent. 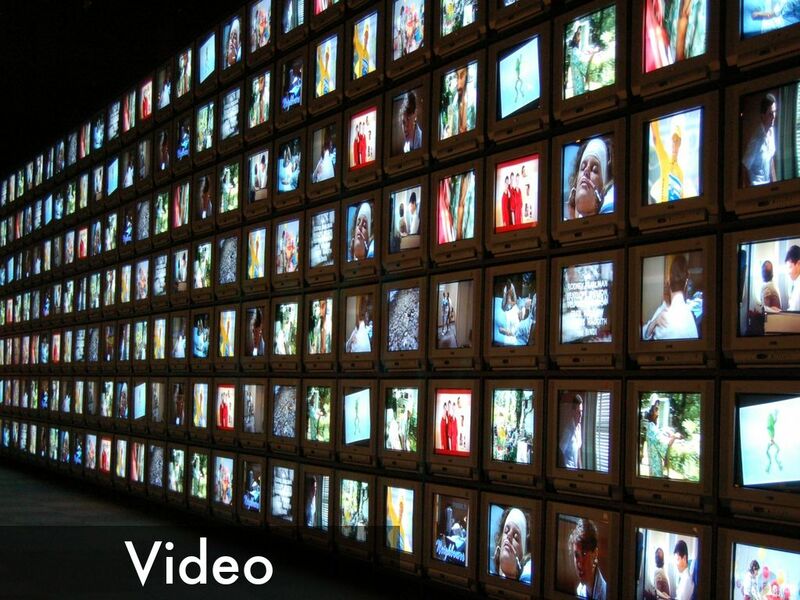 However, when using video as a part of a multi-media presentation certain restrictions apply. 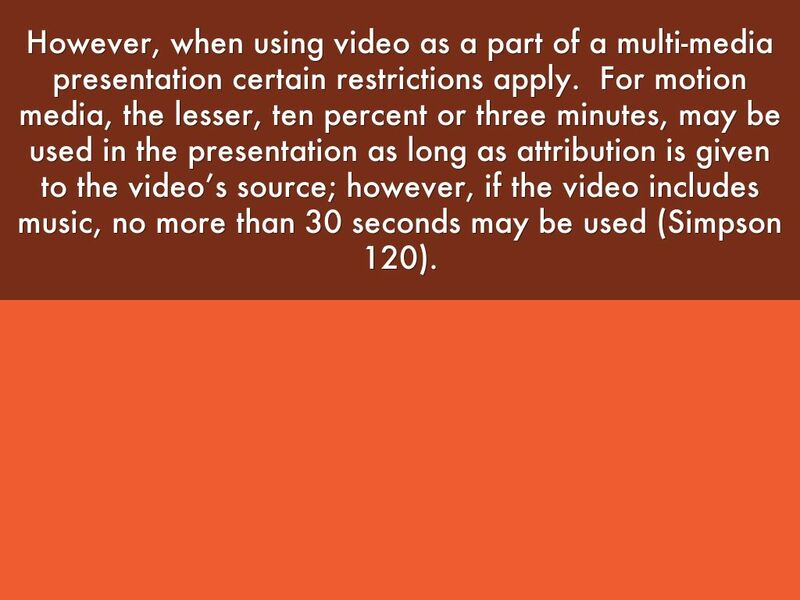 For motion media, the lesser, ten percent or three minutes, may be used in the presentation as long as attribution is given to the video’s source; however, if the video includes music, no more than 30 seconds may be used (Simpson 120). 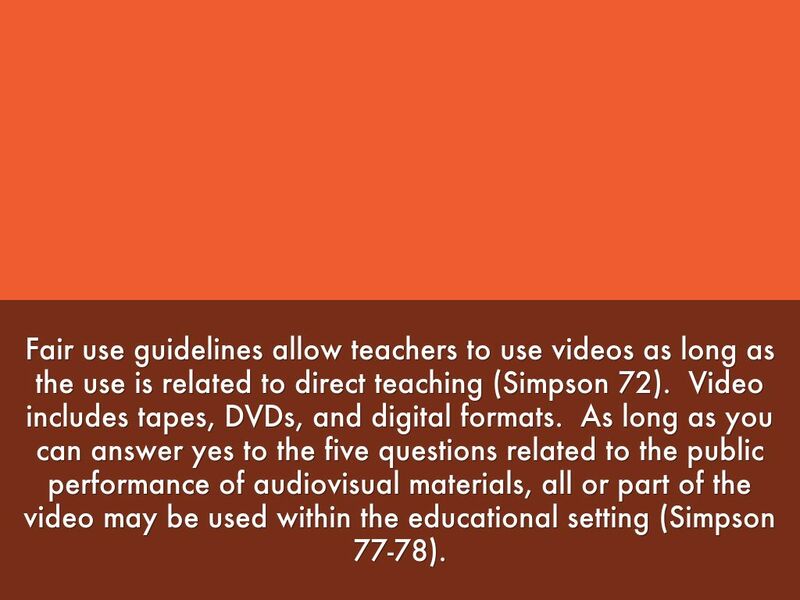 Fair use guidelines allow teachers to use videos as long as the use is related to direct teaching (Simpson 72). Video includes tapes, DVDs, and digital formats. 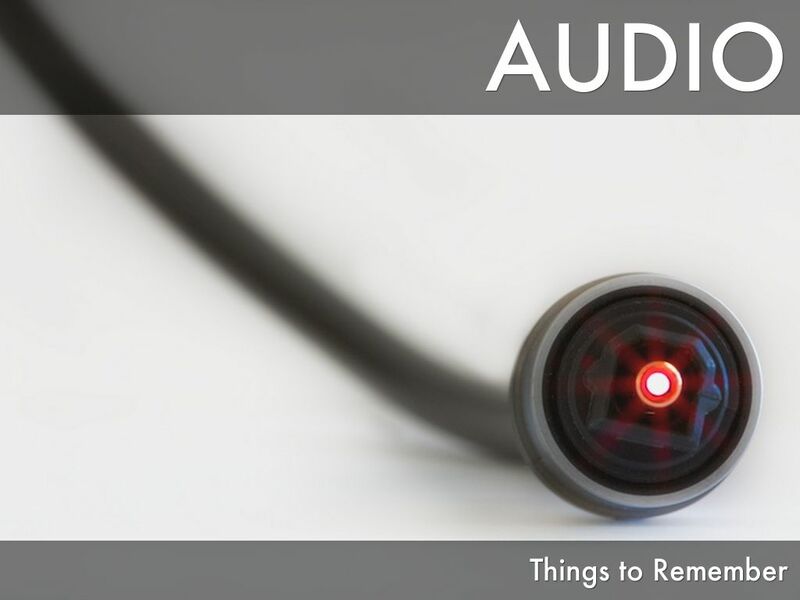 As long as you can answer yes to the five questions related to the public performance of audiovisual materials, all or part of the video may be used within the educational setting (Simpson 77-78). 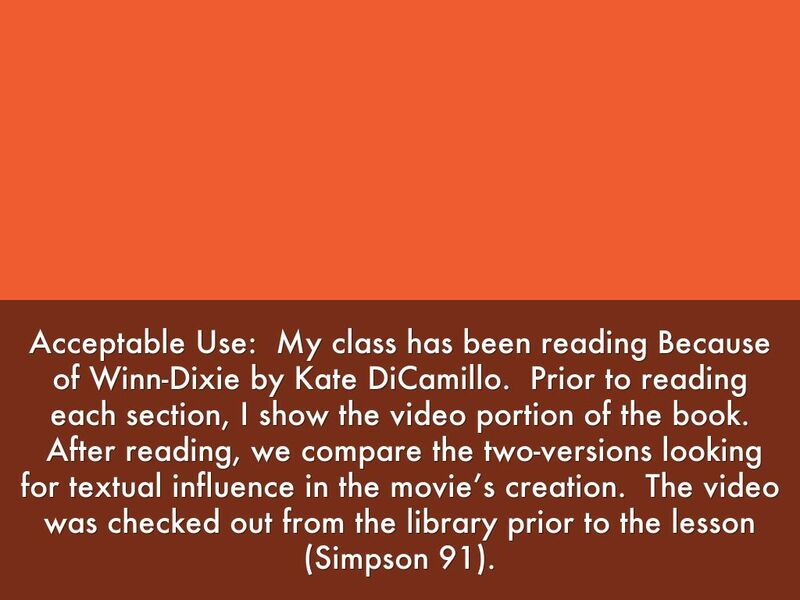 Acceptable Use: My class has been reading Because of Winn-Dixie by Kate DiCamillo. Prior to reading each section, I show the video portion of the book. After reading, we compare the two-versions looking for textual influence in the movie’s creation. The video was checked out from the library prior to the lesson (Simpson 91). 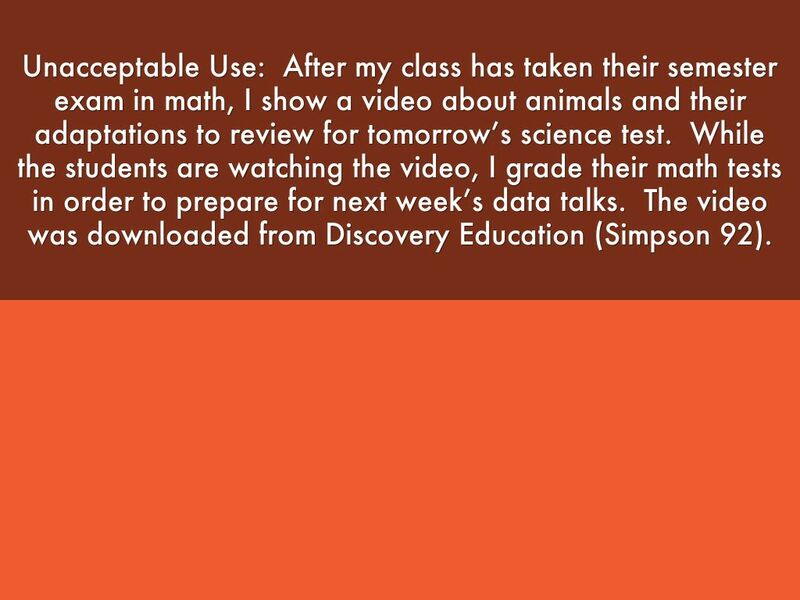 Unacceptable Use: After my class has taken their semester exam in math, I show a video about animals and their adaptations to review for tomorrow’s science test. While the students are watching the video, I grade their math tests in order to prepare for next week’s data talks. The video was downloaded from Discovery Education (Simpson 92). Failure to comply with copyright law can result in legal action. Most cases involving copyright violations are settled out of court (Simpson 17). Regardless of whether or not the case goes to trial, legal fees and damages can quickly add up. Penalties for copyright violations can include actual financial damages or statutory damages anywhere from $750 to $30,000 (17 U.S.C.A § 504). Everyone-teachers, librarians, and administration- are responsible for copyright compliance and can be found liable in court. In addition to federal law governing copyright, many school districts have policy related to copyright (Simpson 20). 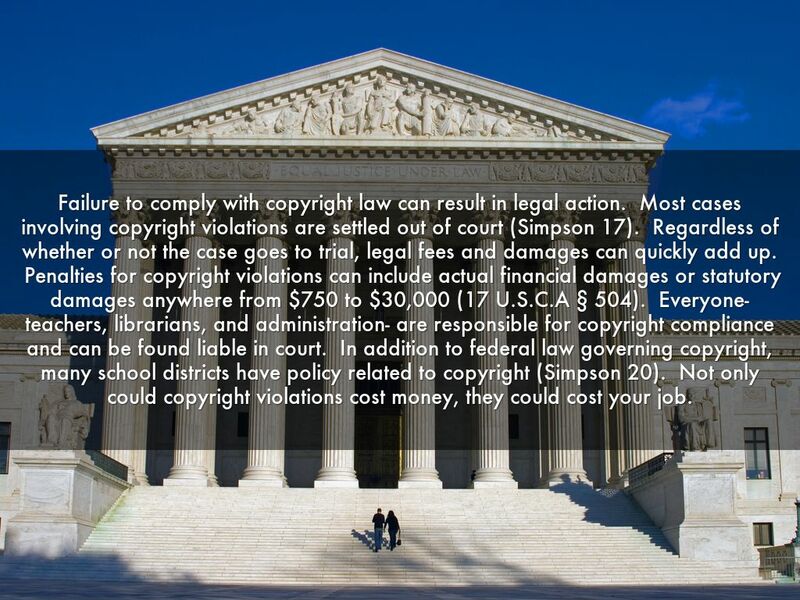 Not only could copyright violations cost money, they could cost your job. Simpson, Carol. Copyright for Schools: A Practical Guide (5th ed). Santa Barbara: Linworth. 2010. United States Copyright Office. (2009). Circular 19: Limitations on exclusive rights: Computer programs. United States Copyright Office. (2009a). 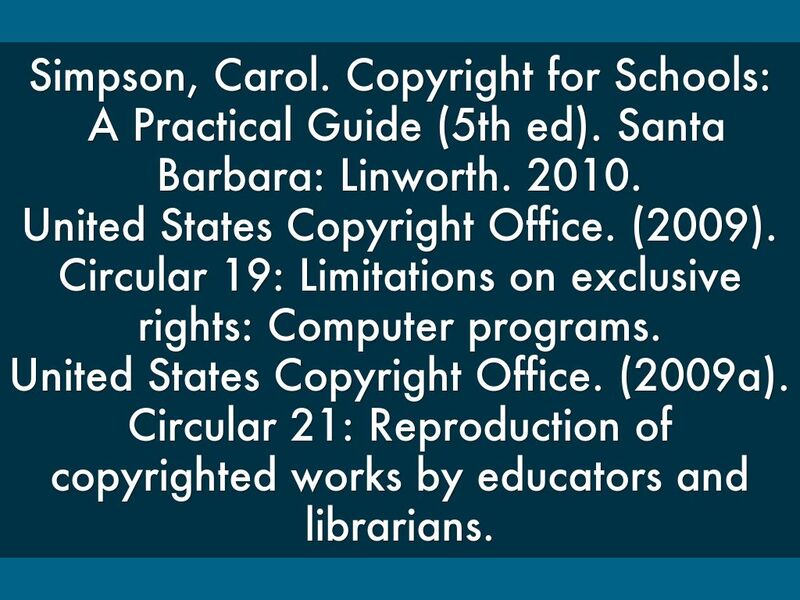 Circular 21: Reproduction of copyrighted works by educators and librarians.